In fact, I’d say that this happens 80% of the time. 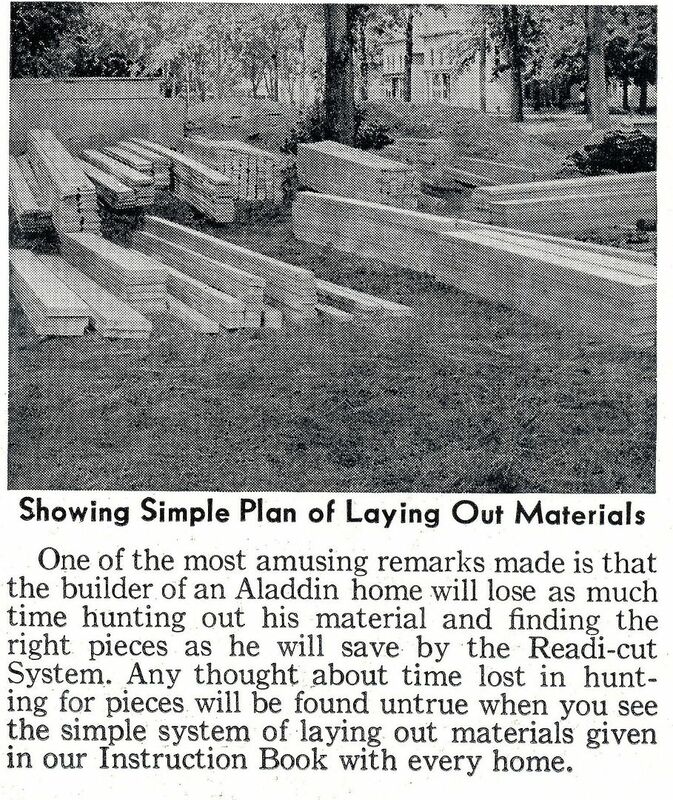 Aladdin kit homes are not Sears kit homes. These are two different companies. 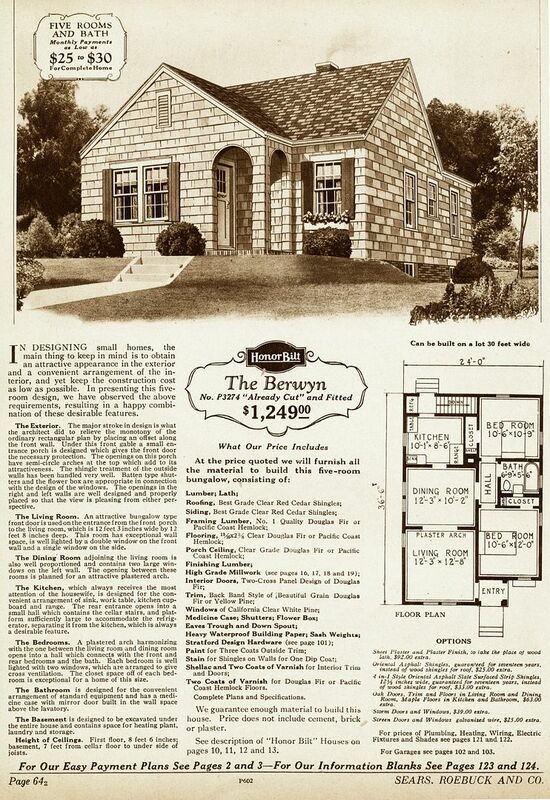 Sears gets all the press, but there were six other companies selling kit homes on a national level and Sears was neither the biggest, nor the longest lived. 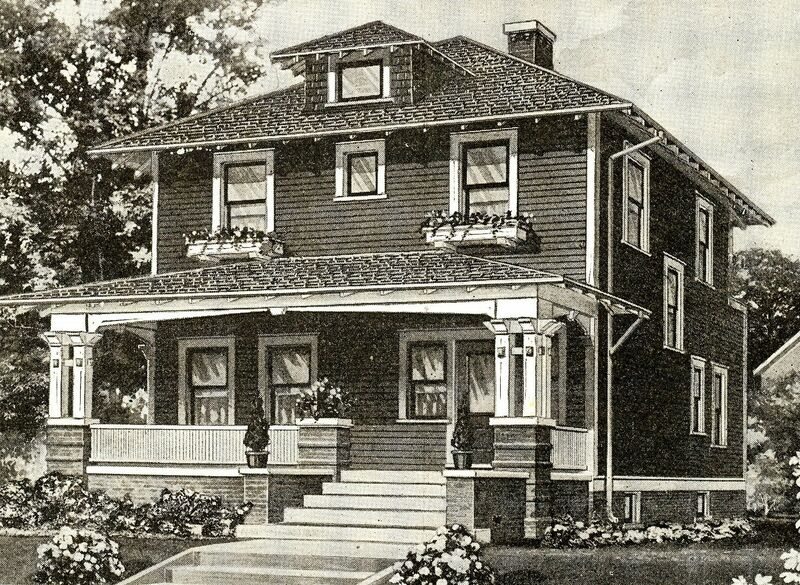 Sears started selling homes in 1908 and was gone by 1940. Conversely, Aladdin issued their first catalog in 1906 and closed their doors in 1981. 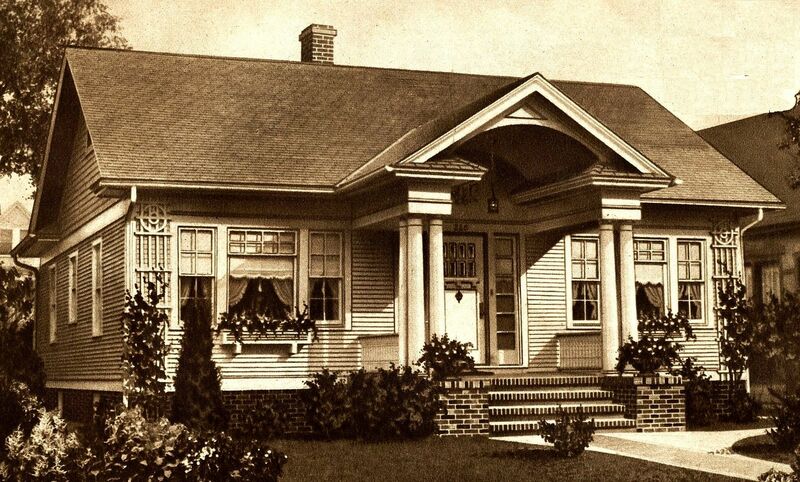 During their 32 years in the business, Sears sold about 70,000 homes. Aladdin sold more than 75,000 homes. 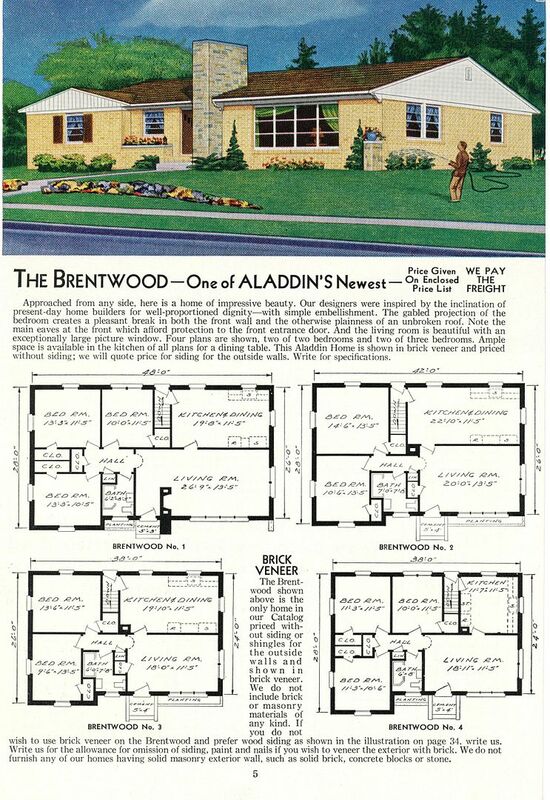 When I wrote my first article about kit homes in early 2000, many folks had never even heard of Sears Homes, so perhaps in time, people will come to appreciate (and know about) Aladdin. 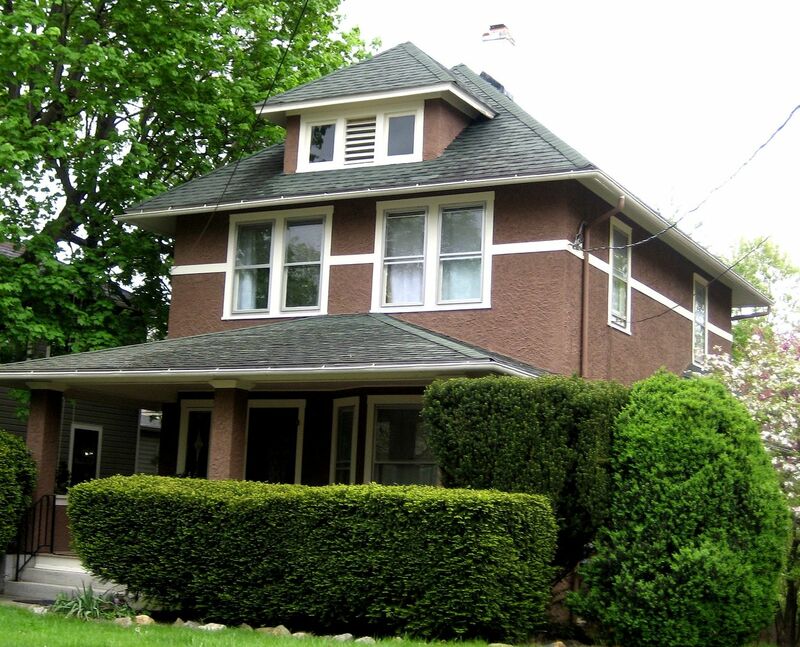 From an architectural standpoint, it’s a more interesting company, just because of the variety of housing styles offered through the decades. And many thanks to Dale Wolicki and Rebecca Hunter for finding the beauty featured below! You can visit Dale’s website here, and you can learn more about Rebecca here. To learn more about identify kit homes, click here. 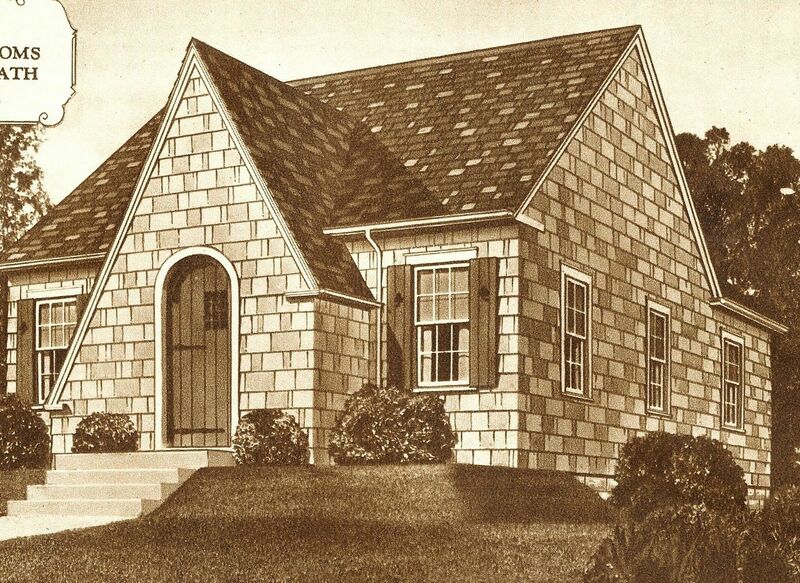 The Brentwood was featured on the cover of the 1951 catalog. 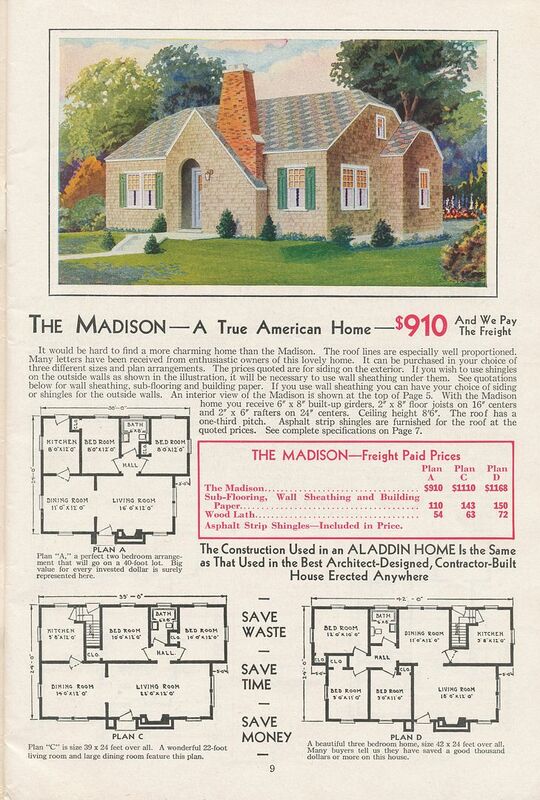 Aladdin was actually a bigger company than Sears, and longer-lived, but today, it seems that fewer people are aware of this company (1951 catalog). Close-up of the picture from the page above. The text explains why it's simple to build with the Readi-cut system. I was hoping that those are Aladdin houses in the background, but I don't think they are. Thanks to the modern marvel of machinery (and electricity), and a central site for pre-cutting all the framing lumber, one man can now do the work of six! 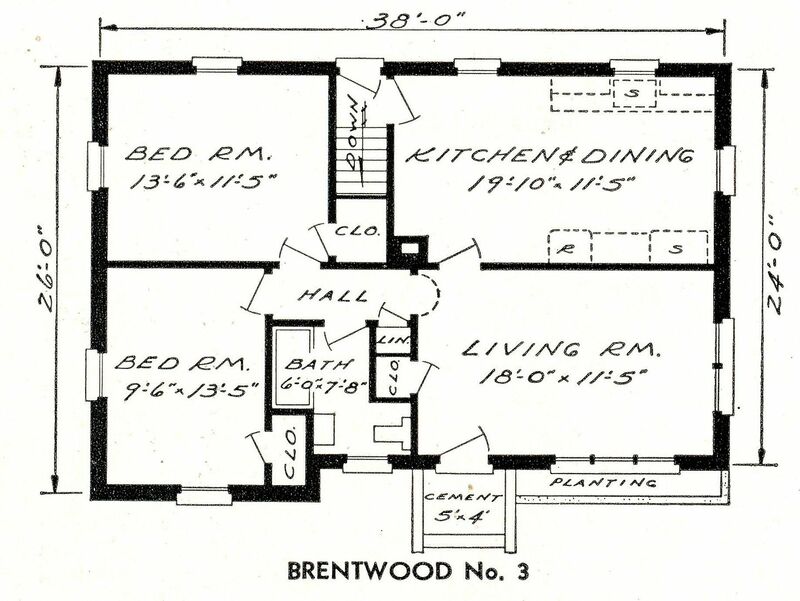 The Brentwood was a dandy house with four floor plans with some variation. 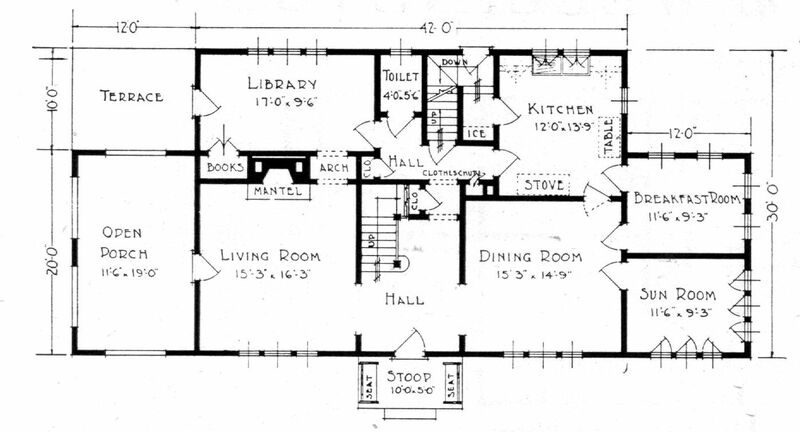 Floorplan one is the only house with a fireplace. 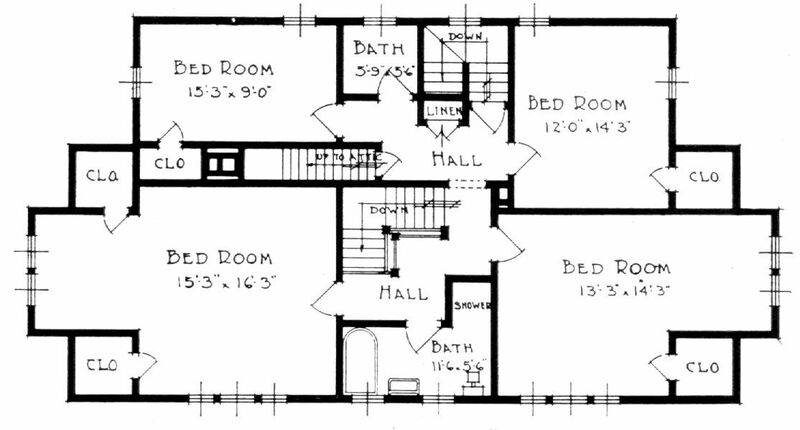 Floorplan two is down to two bedrooms, but has a bigger kitchen/DR. 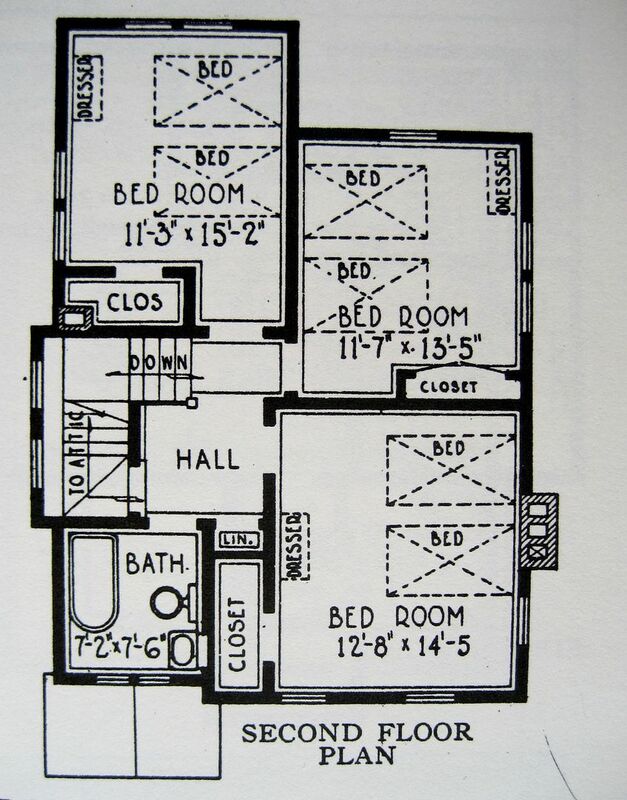 Floorplan 2 and 3 have the same layout, but 3 is a smaller footrpint. 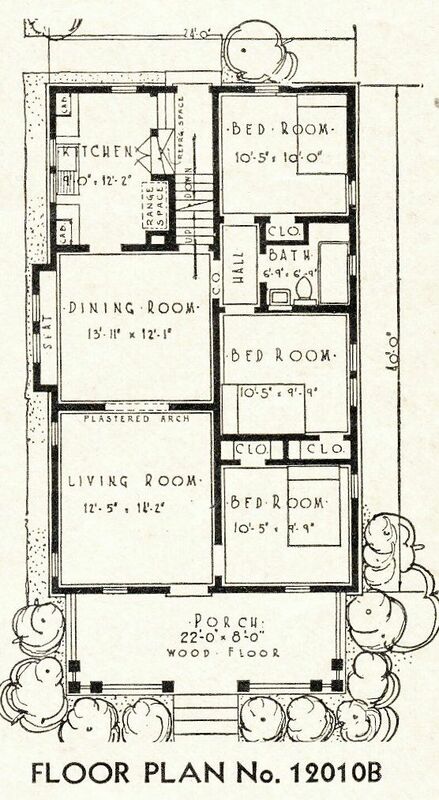 Floorplan 3 and 4 are the same footprint, but with three bedrooms carved into the small space. 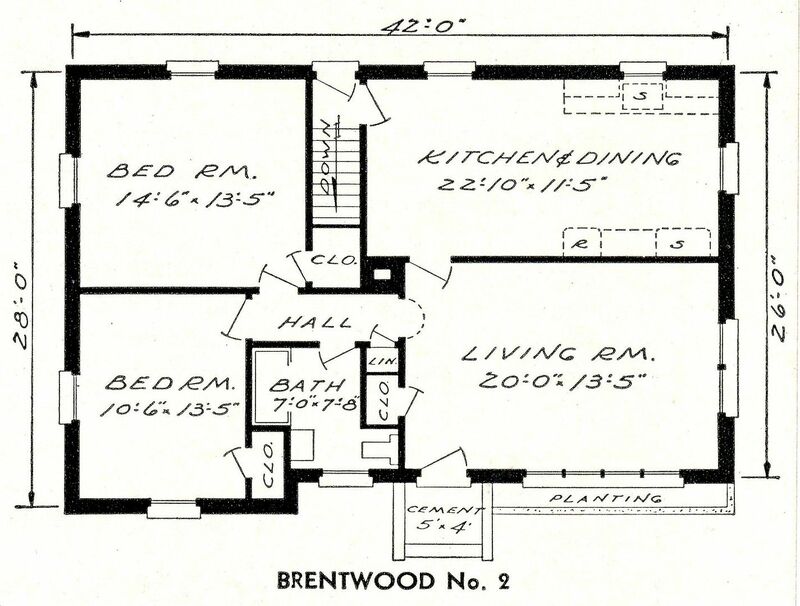 This appears to be Floorplan #1, as it has a fireplace and a planter under that bedroom window. Apparently, the houses in this subdivision have tremendous water pressure. 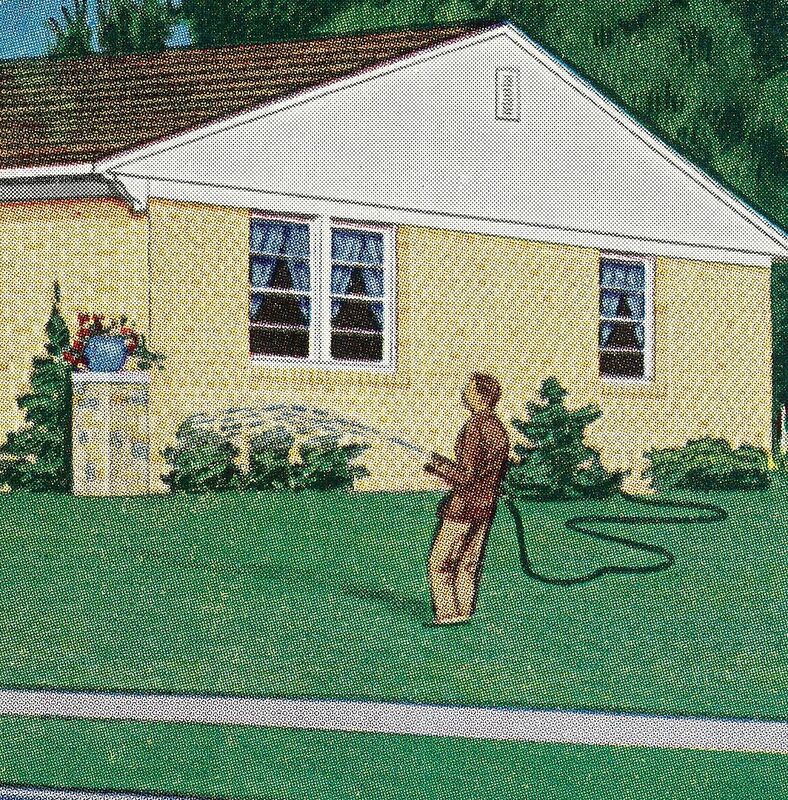 The guy with the house is being pushed backwards. Then again, he also looks like America's first metrosexual. 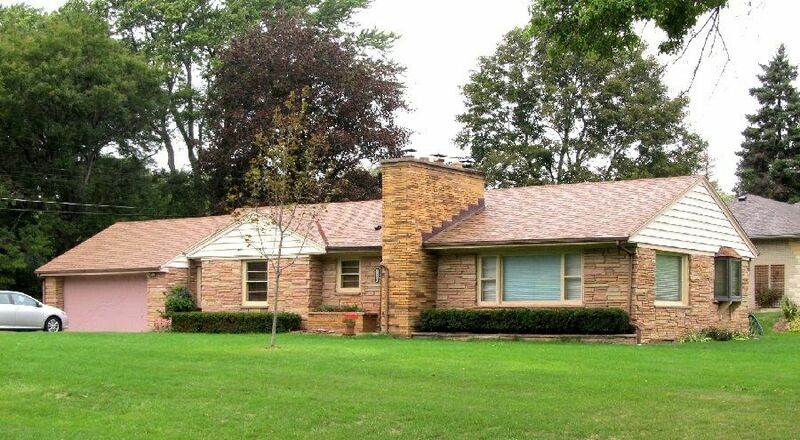 Located in Elm Grove, Wisconsin, this gorgeous Mid-Century Modern Ranch is a perfect match to the catalog image. My favorite feature is that over sized, dramatic fireplace (which appears to have several flues). Photo is copyright 2015 Dale Wolicki and Rebecca Hunter and can not be used or reproduced without written permission. You can visit Dale’s website here, and you can learn more about Rebecca here. Here’s the kind of “research” that makes me 1/3rd sad, 1/4th disappointed and 29/50ths disheartened. 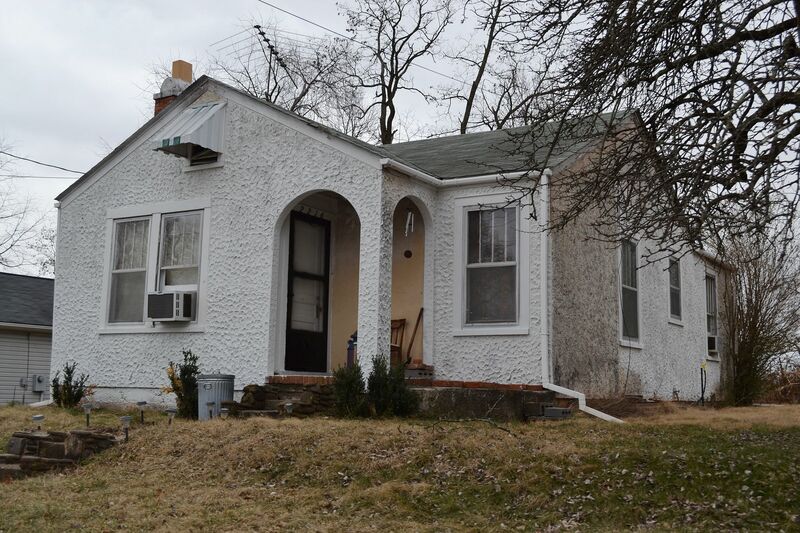 There’s a fellow in Wisconsin who recently discovered that he has a Wardway Home, and has written a blog about it. Cool. Mega kudos to him for writing a blog about his Wardway Home. I suspect that he meant to say that the studs (vertical wall members) are marked, because I’ve never ever heard of wallboards being stamped with shipping information. Ever. Typically, shipping information is found on shipping labels (see image below), which are then affixed to millwork (moldings and trim). A minor point, but using framing members as temporary forms was commonplace, and not a cost-cutting measure. Mixing apples and oranges makes a delightful fruit salad, but in historic architecture, it’s confusing. 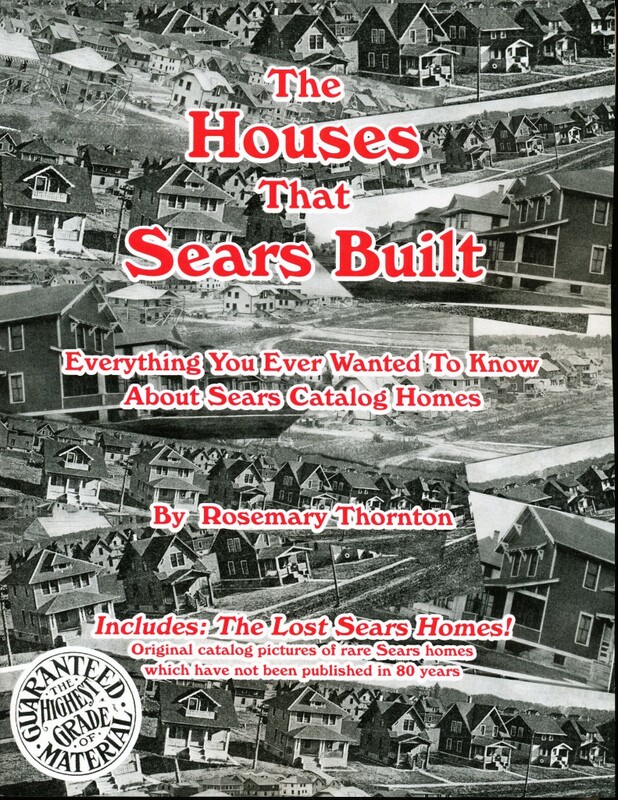 Sears sold about 70,000 kit homes. 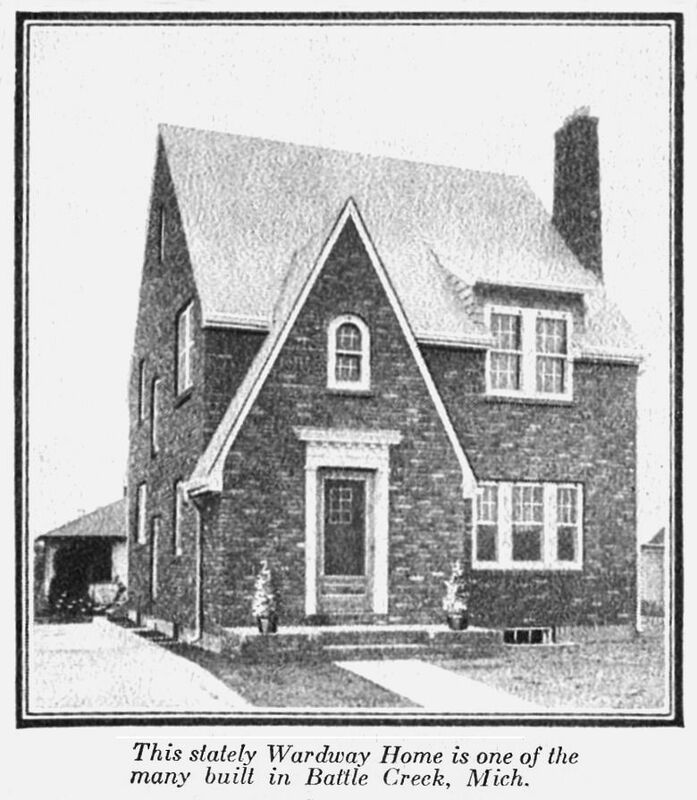 Dale Patrick Wolicki (an architectural historian and co-author of Montgomery Ward’s Mail-Order Homes), estimates that about 25,000 Wardway homes were sold. 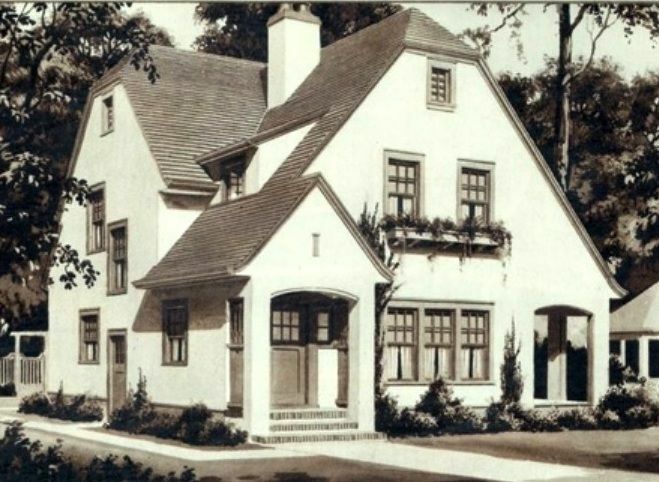 Lastly, the homeowner claims that while the Wardway designs shown in the catalog are not a good match, he did find one home that “does bear a resemblance,” the Wardway Maywood. Hmmm… Given this his home is a one-story house, and the Maywood is two-story, that’s a real mystery. Based on other comments within the blog, I’m confident he’s got a Wardway home, but I wish he’d done a little more research. Written historical records need to be inexorably, meticulously and assiduously accurate. 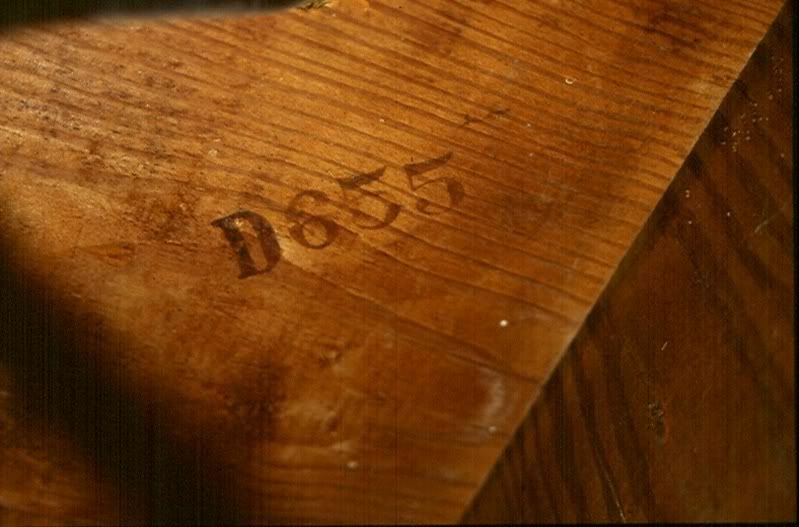 To learn more about identifying marks on lumber, click here. 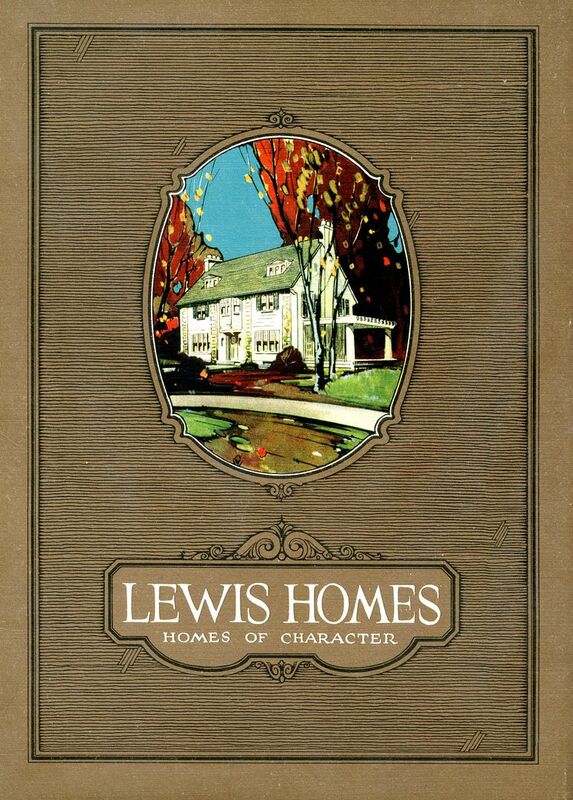 Interested in learning more about wallboard in early 20th Century Sears Homes? Lookie here. Shipping labels are often found on the backside of millwork. I've never seen one on wallboard. 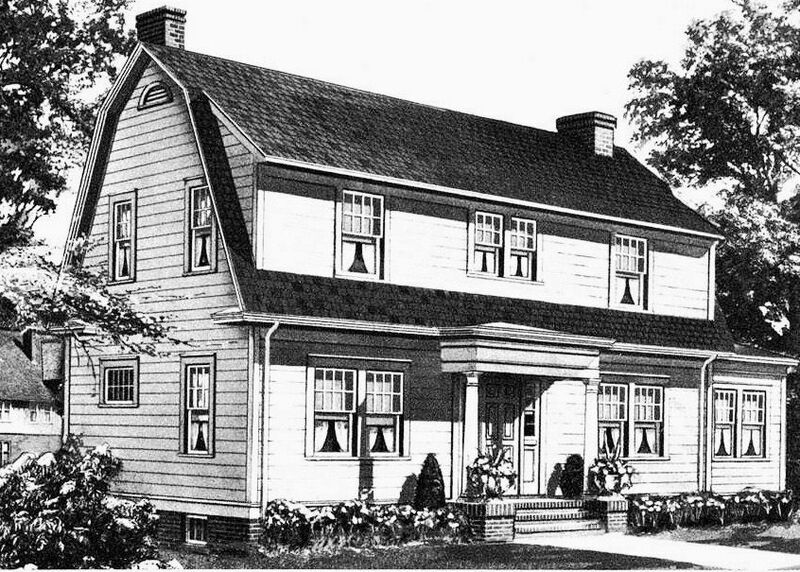 Here's a Wardway "Maywood" as seen in the 1931 catalog. Here's a "customized" Maywood in Battlecreek, MI. 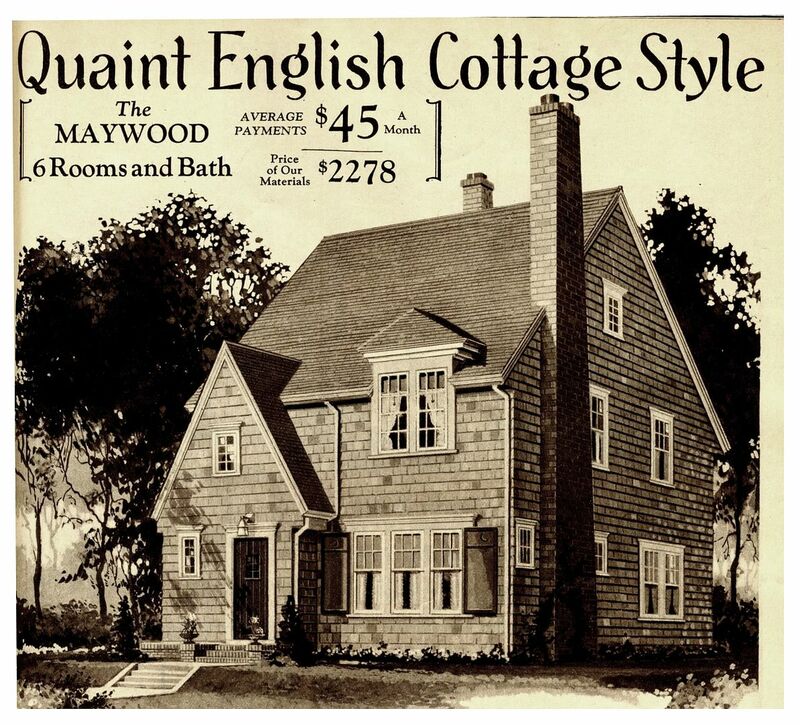 Dale Wolicki found the actual house ("customized Maywood") featured in the Wardway brochure (shown above). Photo is copyright 2012 Dale Patrick Wolicki and may not be used or reprinted with written permission. 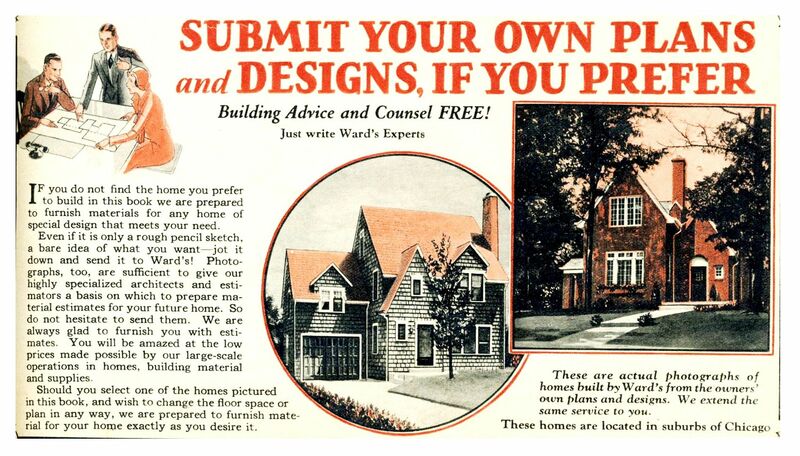 Wardway offered "architectural services" for folks who wanted a unique design. 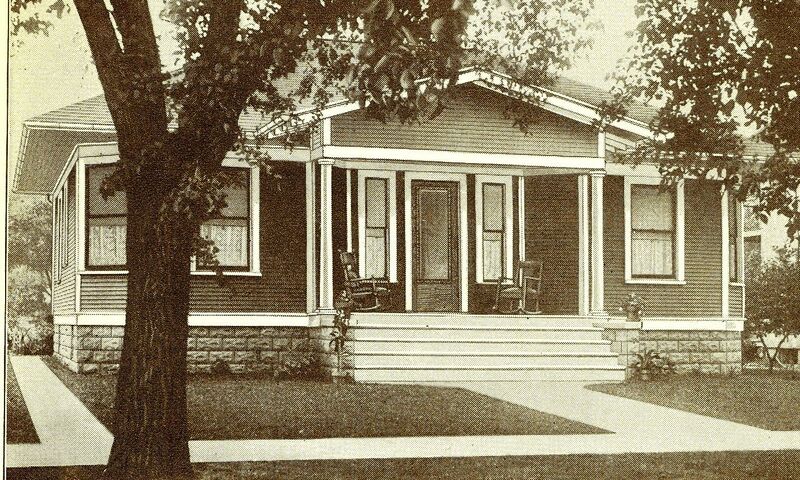 The center image shows a customized Maywood in the Chicago area. 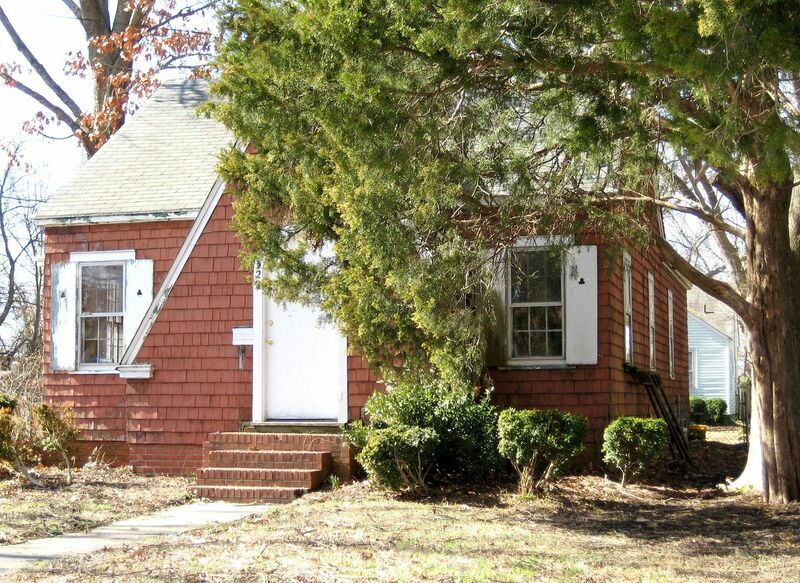 Note that it looks like a Maywood with a garage added to the side. 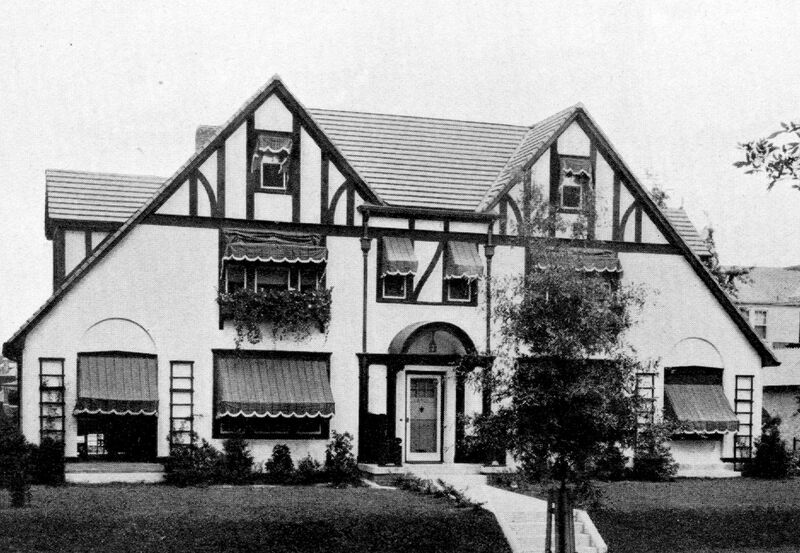 The author says that this home (the Wardway Maywood) does "bear a resemblance" to his customized Wardway, "especially in the floor plan." Unless he's got a bedroom set up in the closet (which does have a nice shelf), I'm baffled on this one. 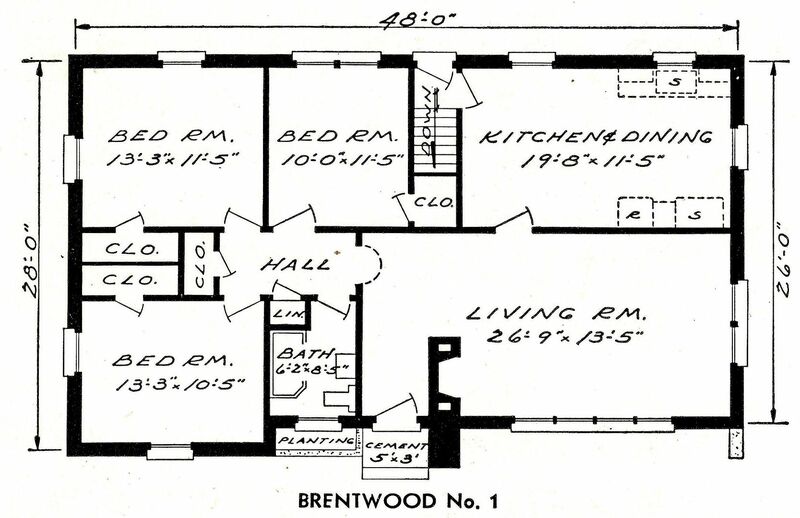 Shown above is the first-floor plan for the Wardway Maywood. 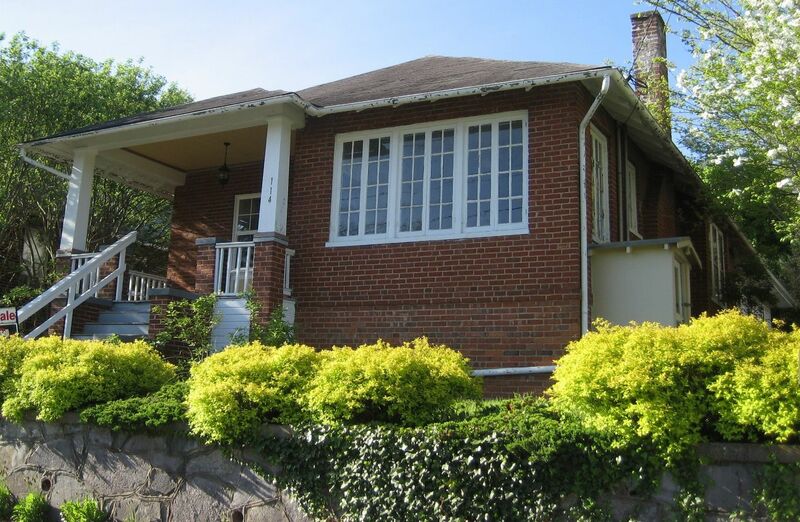 Here's the subject house, the "customized Wardway Maywood." 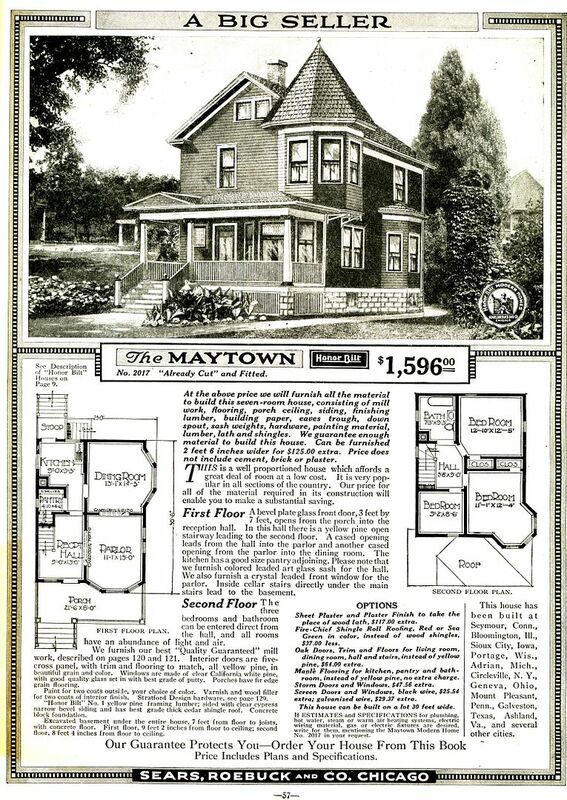 The small inset is the 1931 Maywood. 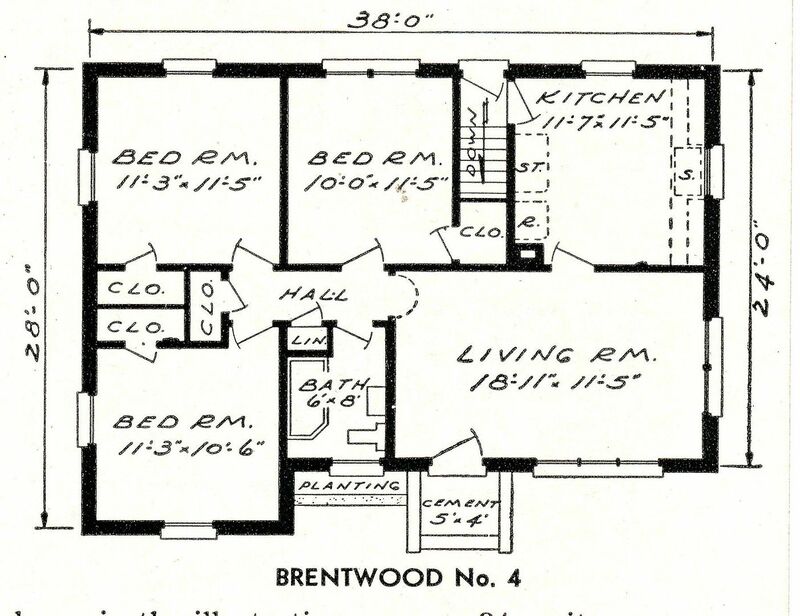 Frankly, I think it looks more like this kit home: The "Brentwood." Or maybe it's a Magnolia, customized. 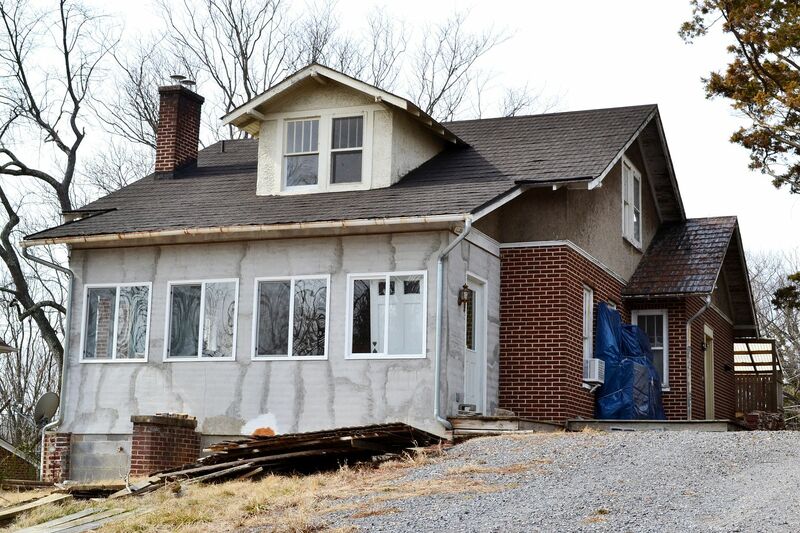 A couple days ago (May 1st), I returned to Staunton to do a little more research on the kit homes in the city (in preparation for my talk on May 2nd), and this time, I was driven around by Frank Strassler, head of the Historic Staunton Foundation. It’s a lot easier to focus on kit homes when someone else is doing all the driving, and especially when that someone else knows where they’re going! 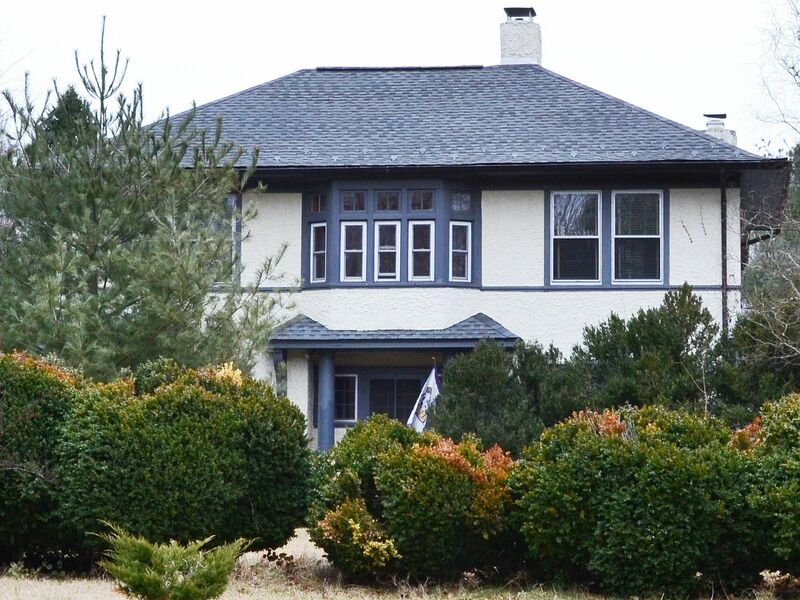 We found many kit homes that I’d not seen during a prior visit, and the most intriguing find was the four Harris Brothers kit homes we discovered. 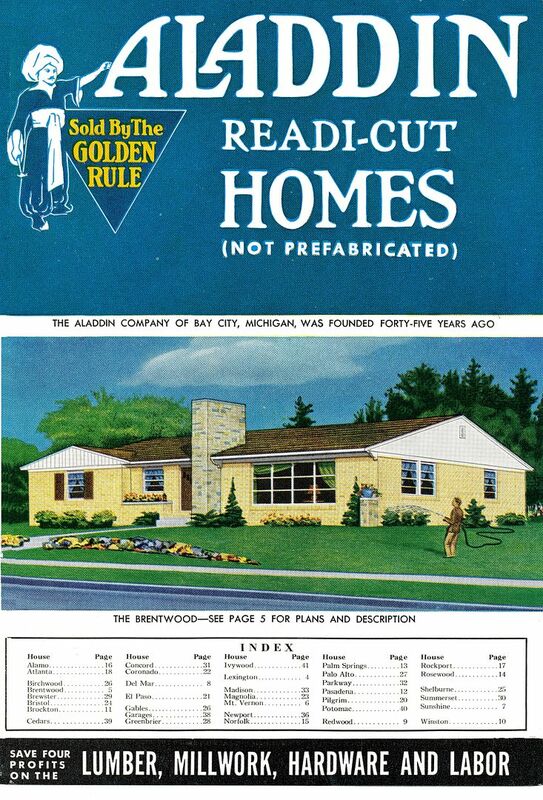 Frankly, I suspect there are more than four HB houses in Staunton, but I’m not that familiar with this company and, I have very few of their catalogs. 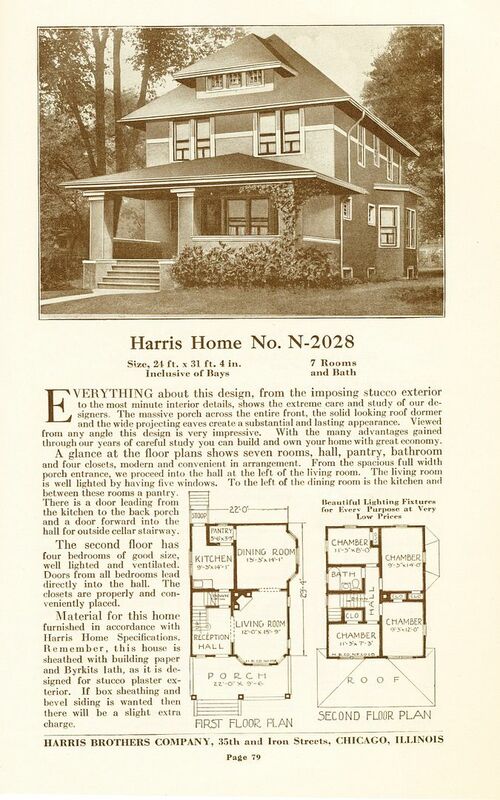 Harris Brothers (formerly the Chicago House Wrecking Company) was based in Chicago, Illinois. 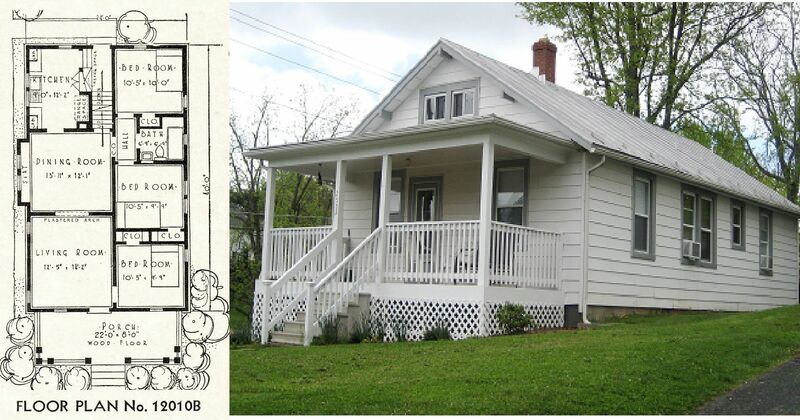 How did four Harris Brothers houses end up in Staunton? And three of them were in the same neighborhood (Sears Hill). Hopefully, some of Staunton’s history loving residents will poke around a bit more, because I’m sure there are many more hidden architectural treasures just waiting to be found. It was sheer bliss to realize that I was surrounded by so many history lovers. In all my travels, there’s typically a lone voice (or less), that correctly answers that question. The people of Staunton really do love their history, and better yet, they know their history, and that’s such a joy to behold. OOOH, an update! Read about my newest find in Staunton here! First, my favorite find in Staunton. 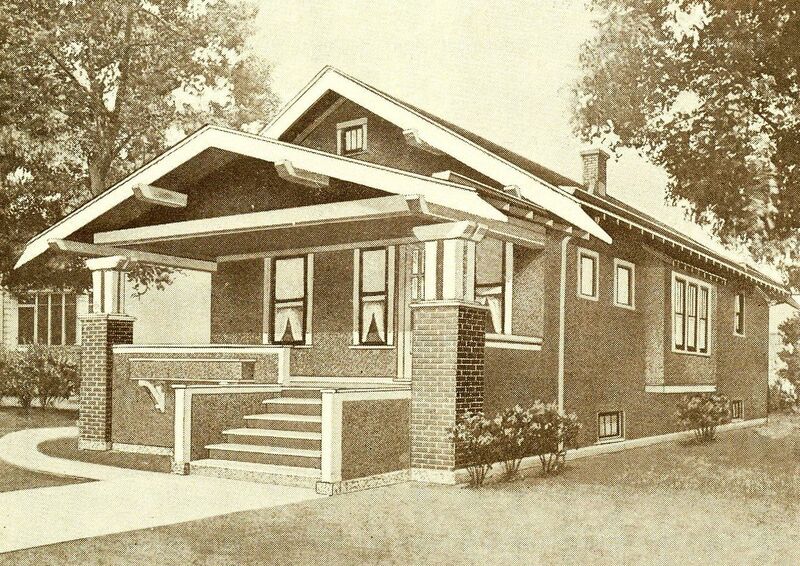 Shown above is Modern Home #2028 from the 1923 Harris Brothers catalog (courtesy of Dale Wolicki). 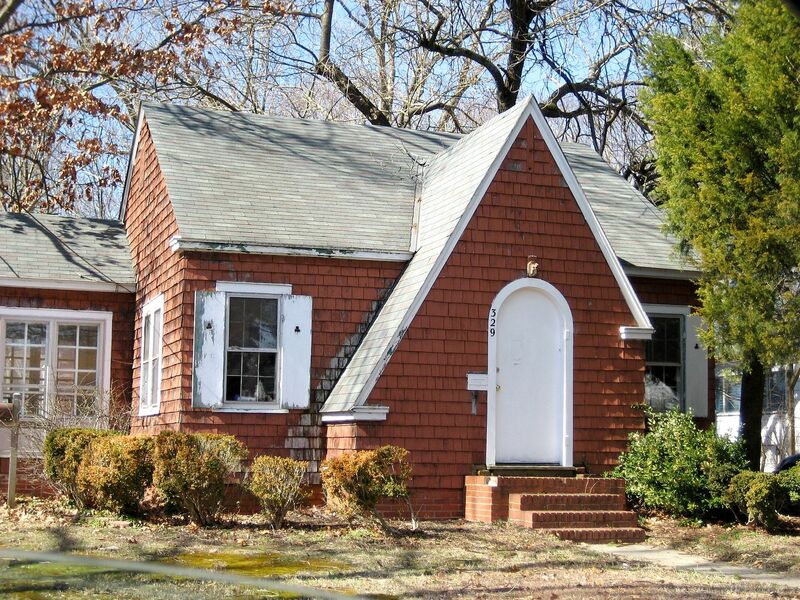 It looks like a massive house, but in fact, it's 22 feet wide and 29 feet deep. Originally, I snapped this photo just because it seemed like a good idea. 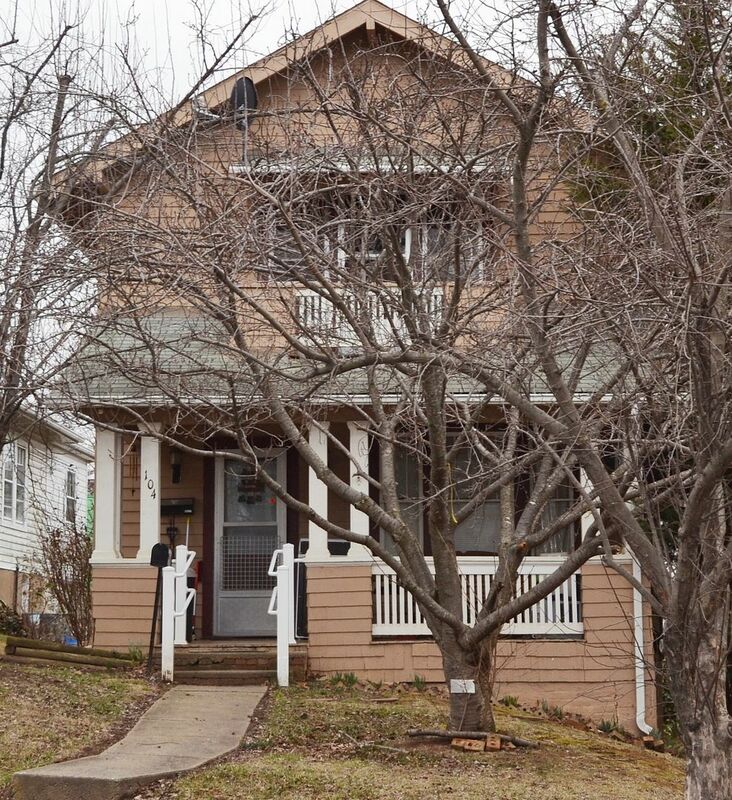 Sometimes, something will trigger a memory, and I didn't consciously remember having seen this house, and yet, when I got back to my hotel and started going through the old catalogs, I realized it was a perfect match to the Harris Brothers #2028! And, as a nice bonus, I even managed to snap my one photo from the perfect angle! 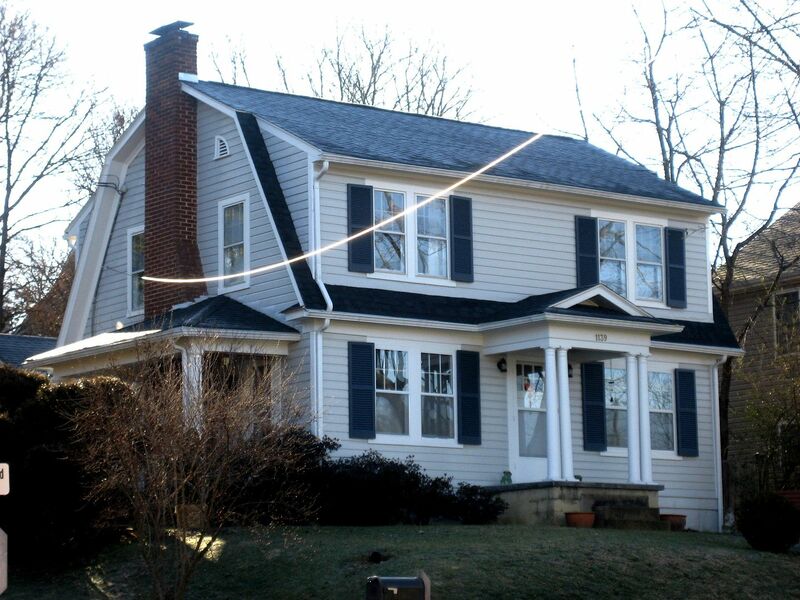 Though not easily seen in the photo above, the house in Staunton has the two bay windows, just as it should! 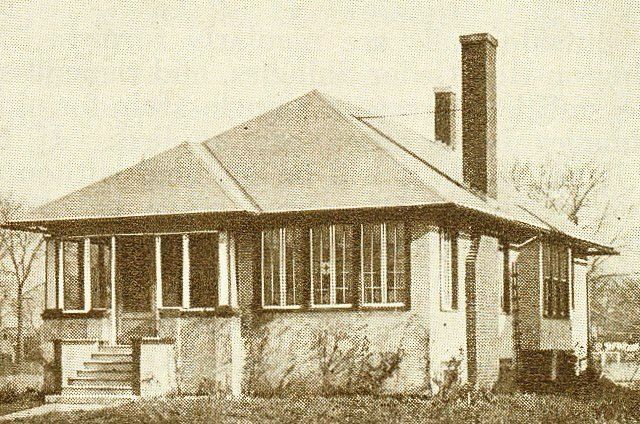 The other three Harris Brothers homes were in one neighborhood: Sears Hill. 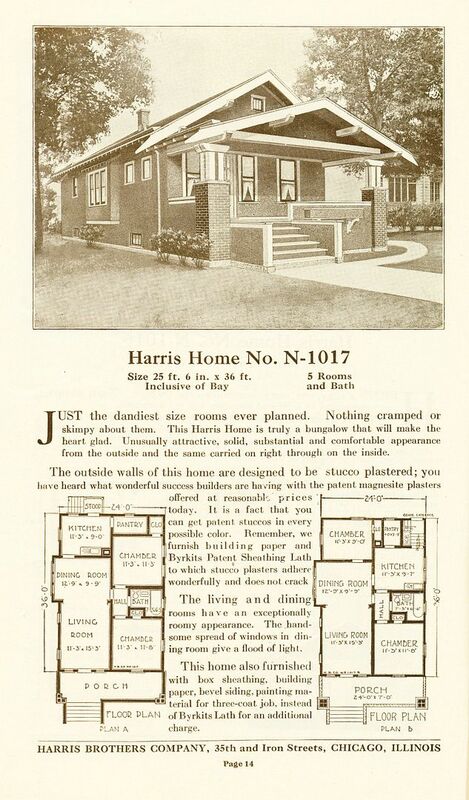 Shown above is Modern Home #1017 from the 1923 Harris Brothers catalog (courtesy of Dale Wolicki). The HB 1017, as seen in 1923. And here's the 1017 in Staunton! 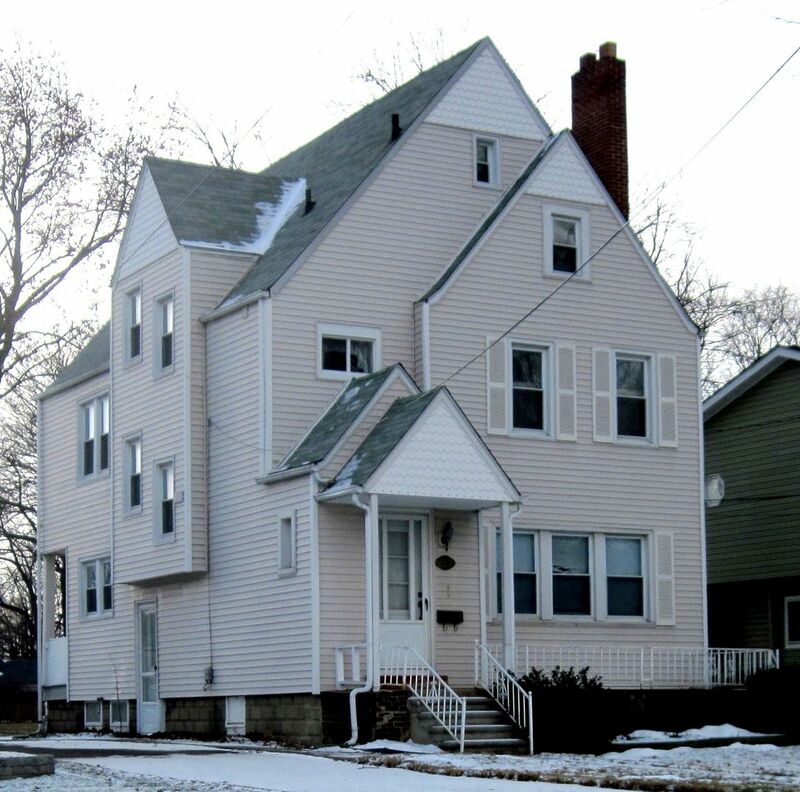 Look at the unique window arrangement on the home's front. 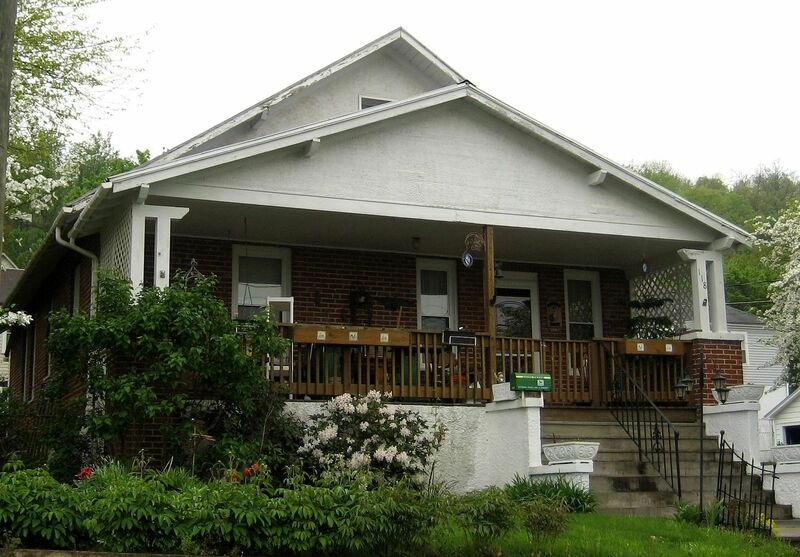 And check out those unique columns, and the bracketing under the eaves. It was tough to get a good photo, but the little attic window is also a spot-on match to the catalog page. 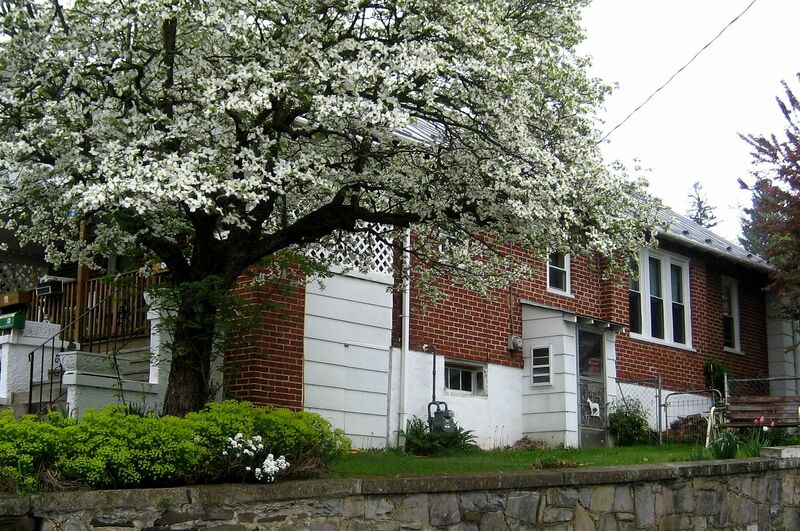 The house is 24 feet' wide and 36 feet deep. 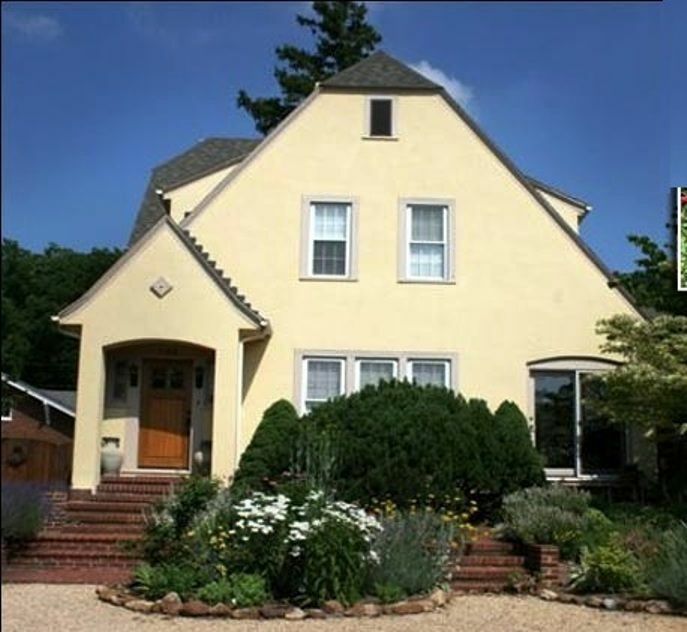 The dimensions of this house (shown above) seem to be a good match! The line drawings (from the original catalogs) are sometimes a little bit off in scale and proportion. If you look down the side, you'll see it's a good match there, too. 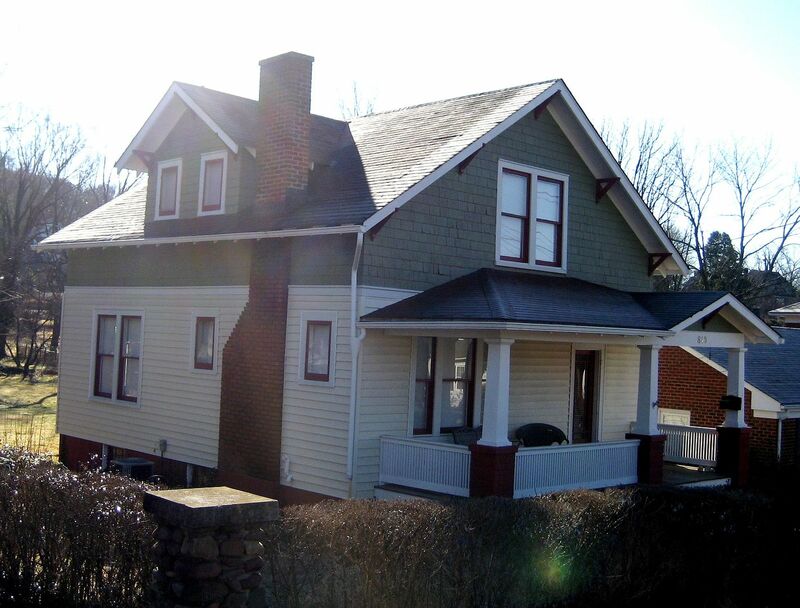 BTW, Staunton is very hilly, and I learned that it's tough to get good house photos in hilly neighborhoods! And, the angle skews the proportions. Short of carrying a 20-foot stepladder around on top of the Camry, I'm not sure how to solve this. HB # 1025 was another "favorite" find for me, and yet another kit home that I'd never seen before. 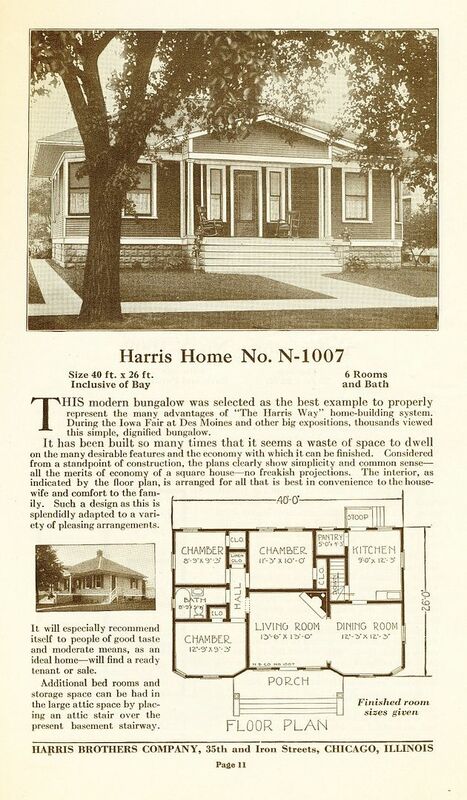 From the 1923 Harris Brothers catalog (courtesy of Dale Wolicki). HBClose-up of HB #1025. 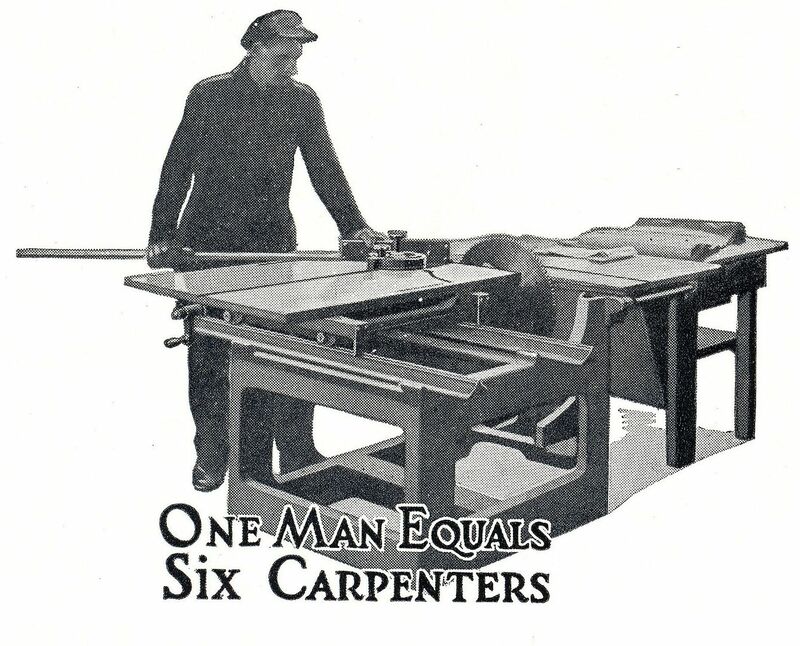 From the 1923 Harris Brothers catalog (courtesy of Dale Wolicki). 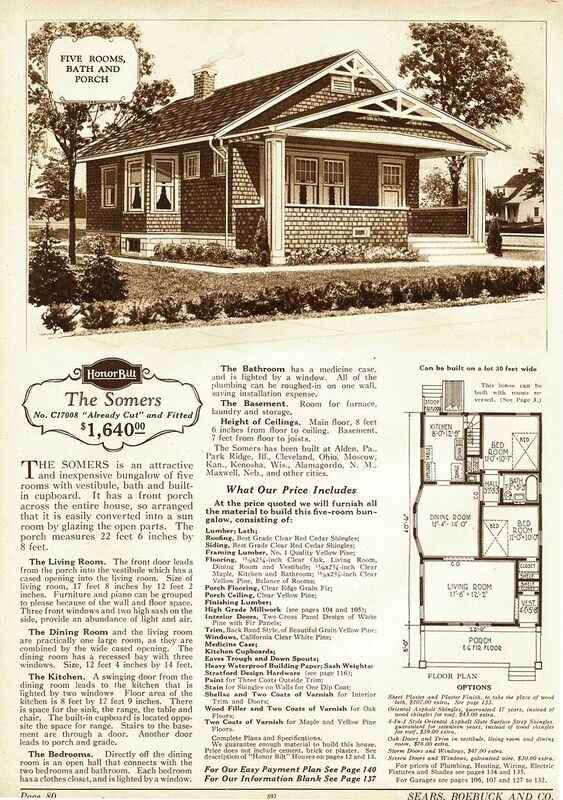 At the lower right of that catalog page (seen above), is an actual photo of a HB #1025. 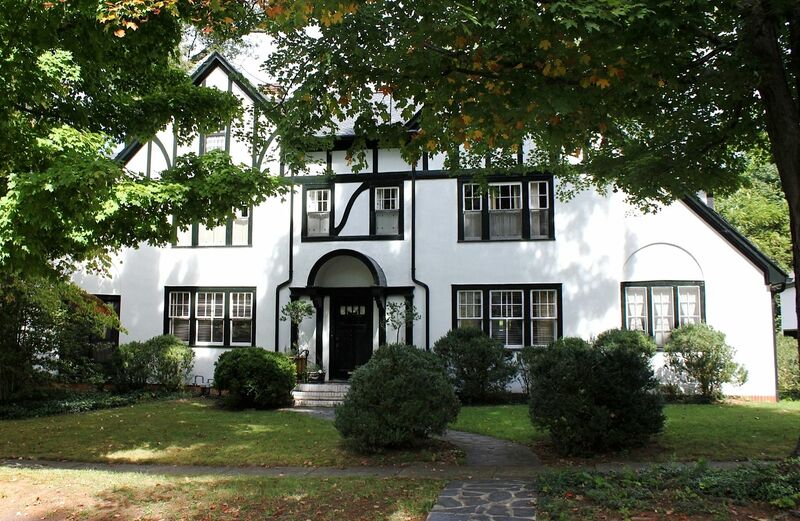 This photo shows off those beautiful six casement windows on the front. What a fine house! Here's a real life example of HB #1025. 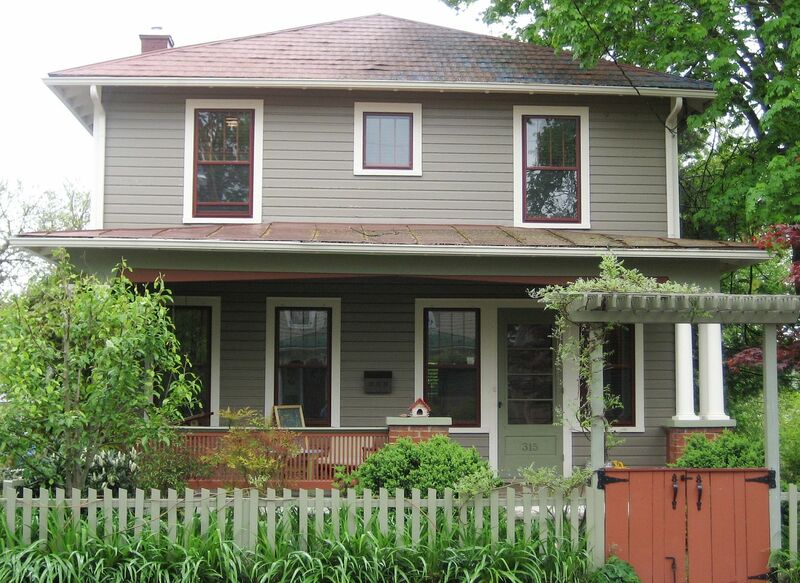 And look at those pretty casement windows! 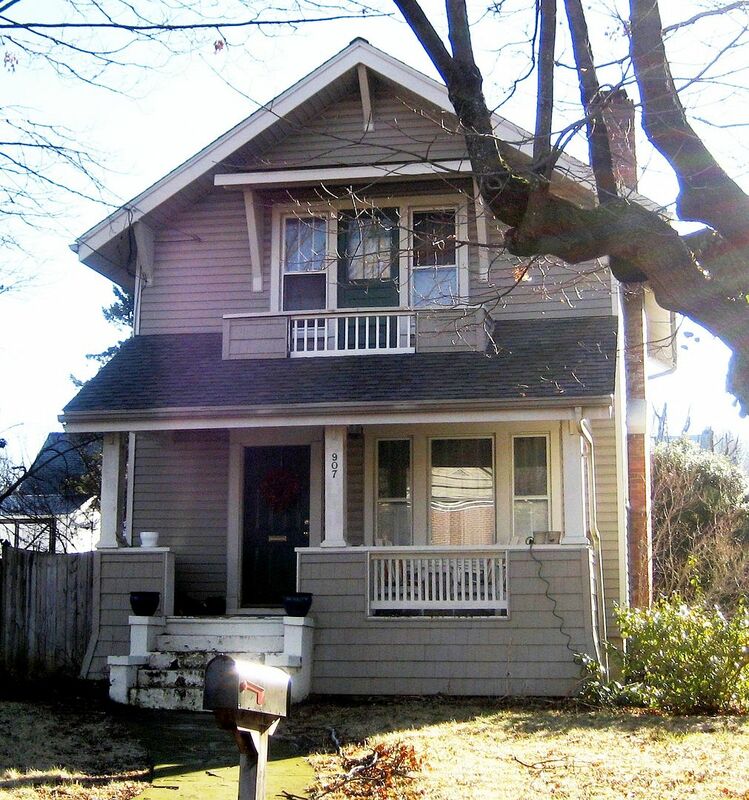 Were it not for those original windows, I'm not sure I would have recognized this 90-year-old kit home. Another view of those wonderful old casements. 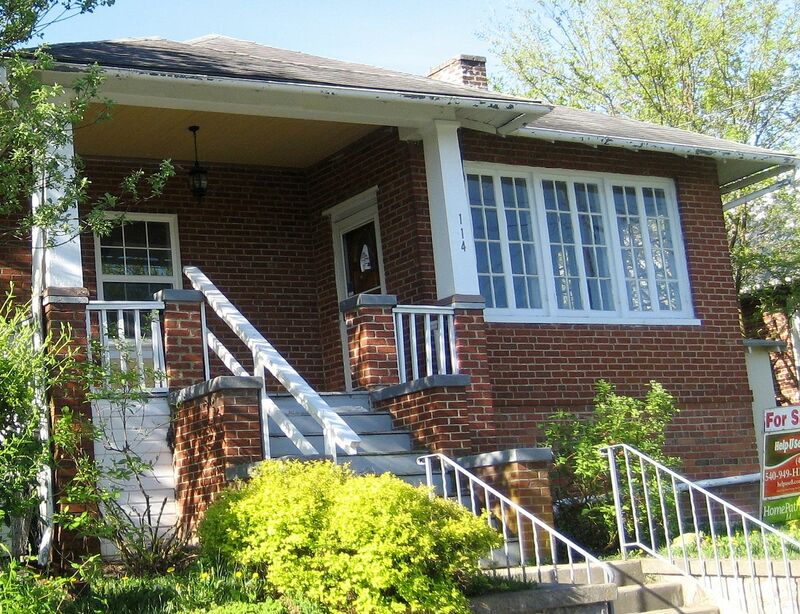 By the way, apparently this house is for sale. Someone should contact the owner and let them know - this is a kit house! 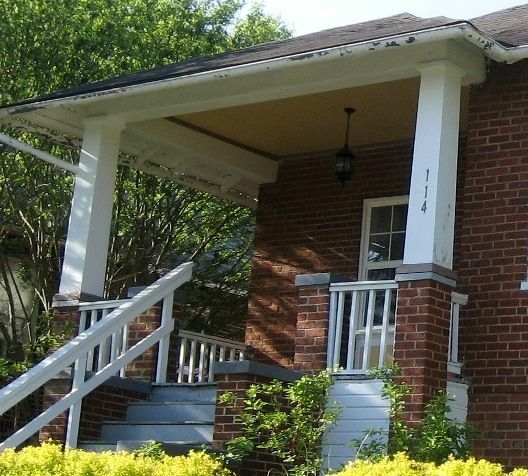 Close-up of the porch columns. And this house still has its original gutters. HB #1007 was one of their more popular designs, however... 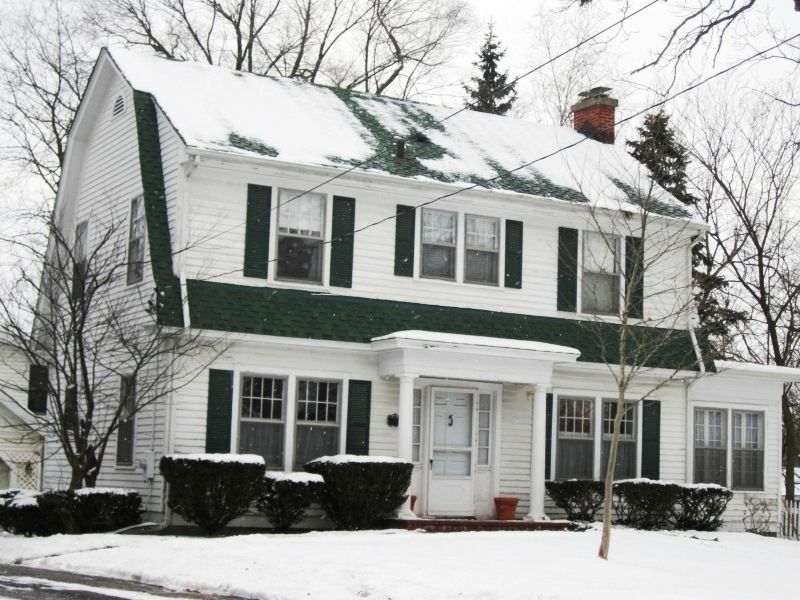 It's also a house that has several "twins." 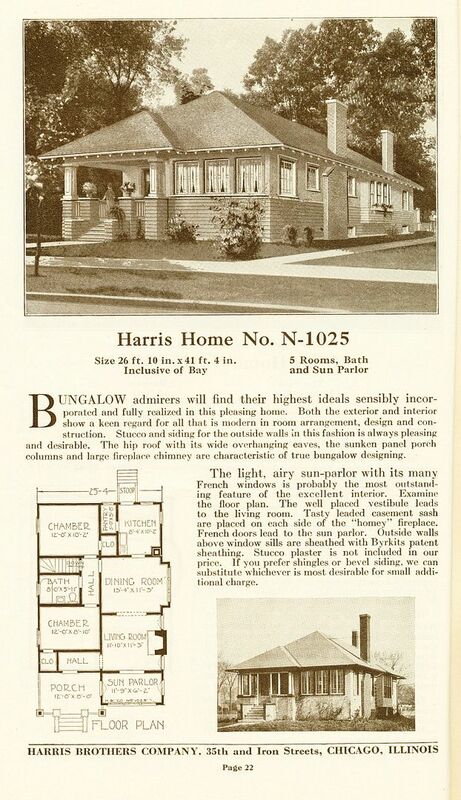 Given that Staunton's #1007 is within three houses of the other two HB homes, I'm going to assume that the model in Staunton is indeed from Harris Brothers. Nice house, isn't it? Love the rocking chairs! While we were out driving around, I also spotted a Sears Woodland. The Woodland is an eye-catcher because it has those two full-sized windows flanking the front door. 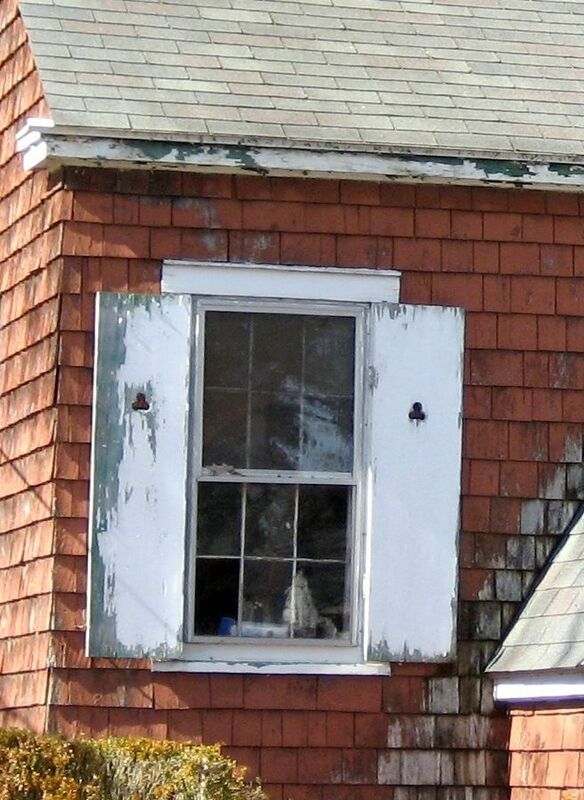 And it has an unusual window arrangement down the right side (as shown here). 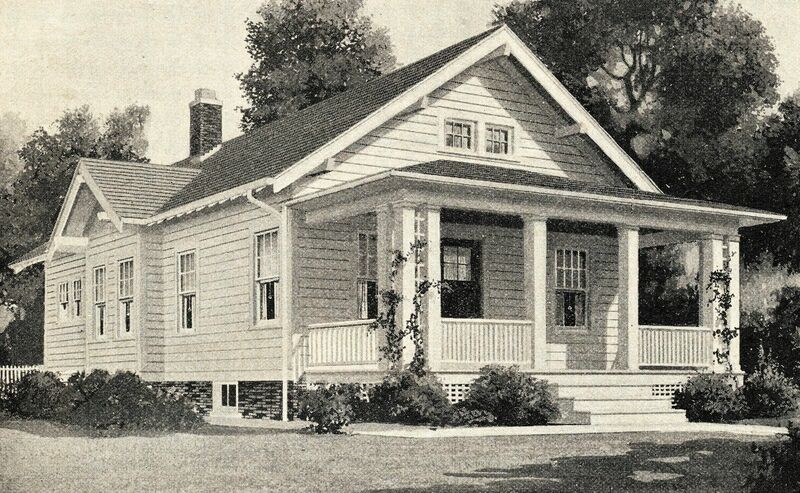 This image is from the 1919 catalog. 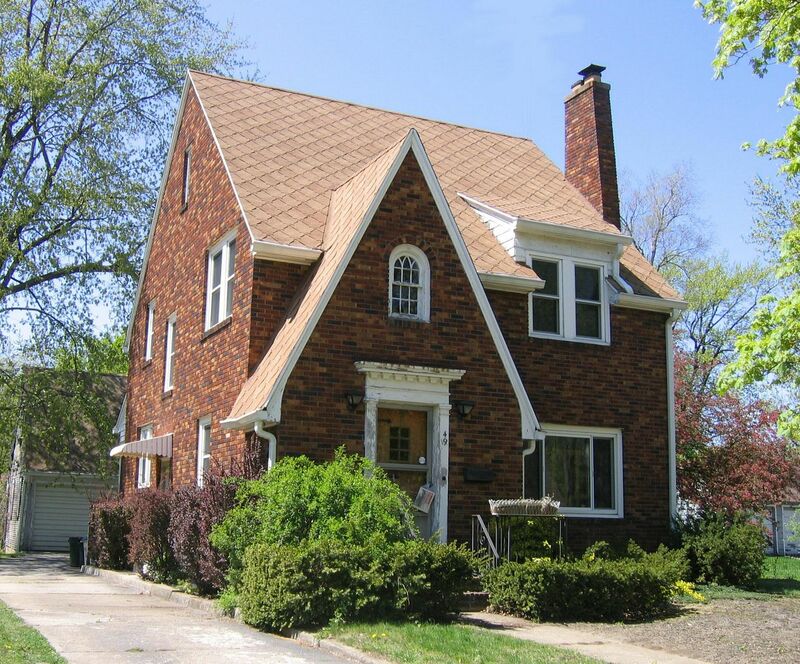 The small attic dormer is missing but other than that, this is a great match. 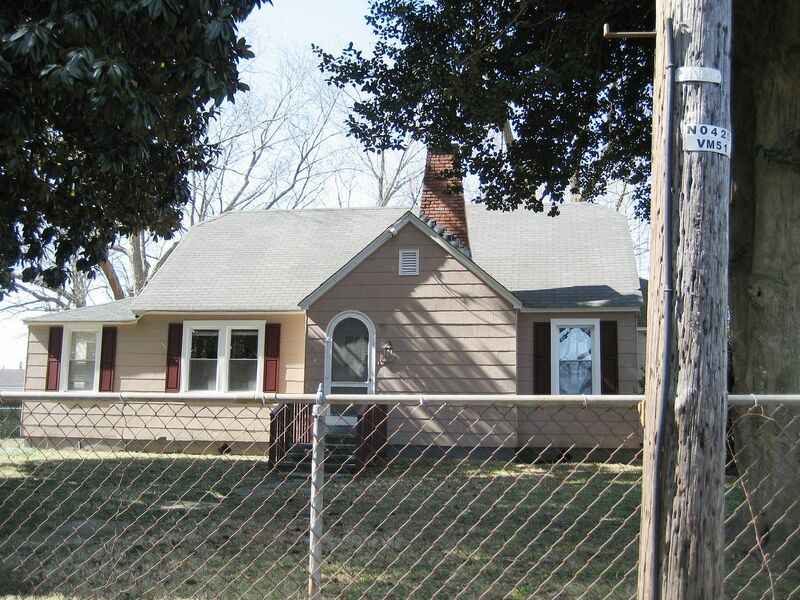 Due to landscaping, I was not able to get a good photo of that right side, but it does match the catalog image. 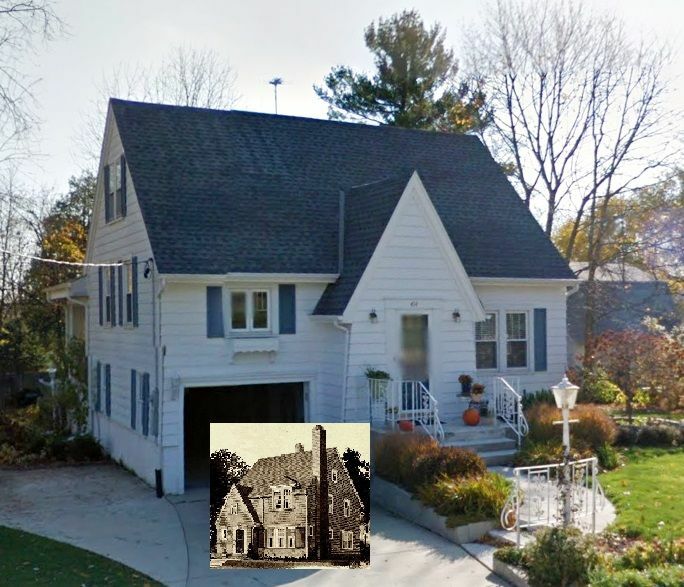 Was the house built sans dormer, or was it removed during a roofing job? Hard to know, but I'd guess that it was built this way. 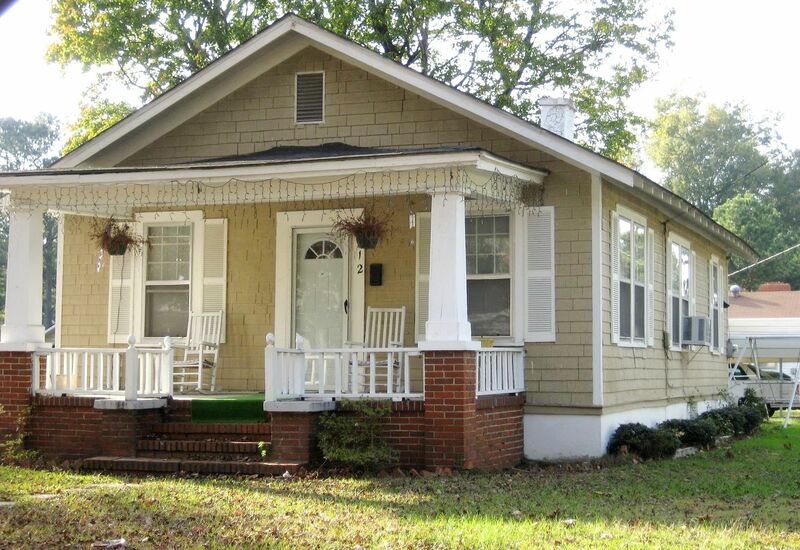 And, this house is next door to the big Harris Brothers foursquare (#2028). 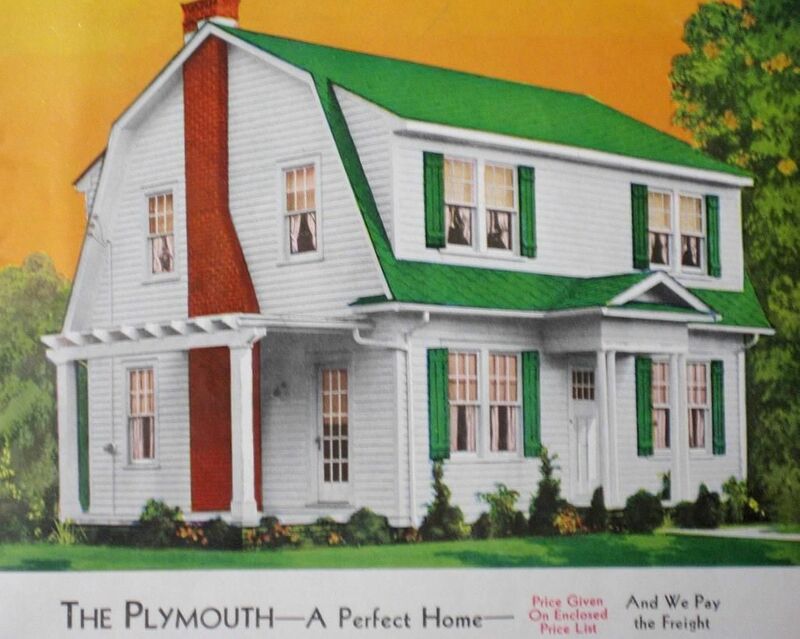 Another fun discovery on this most recent trip was the Sears Winona in Staunton (1938 catalog). 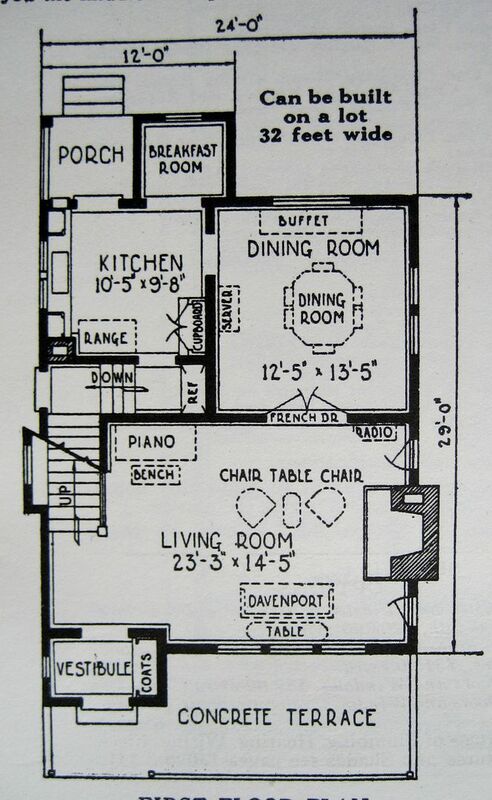 This house was offered in two floorplans (in 1938). 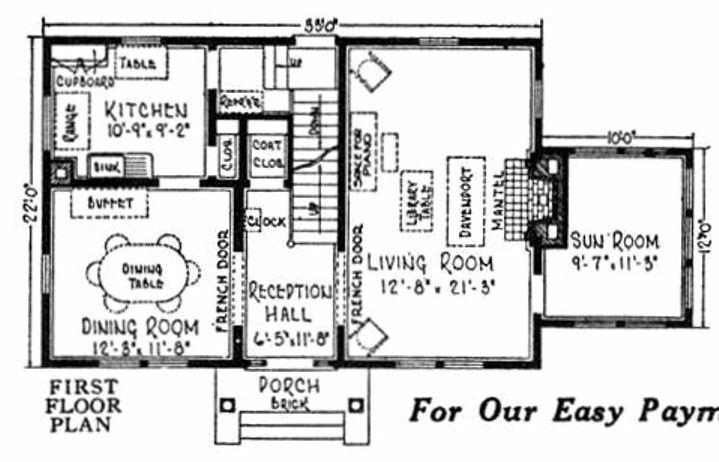 The floorplan shown here is a match to the house in Staunton. It squeezes three bedrooms into 960 square feet. 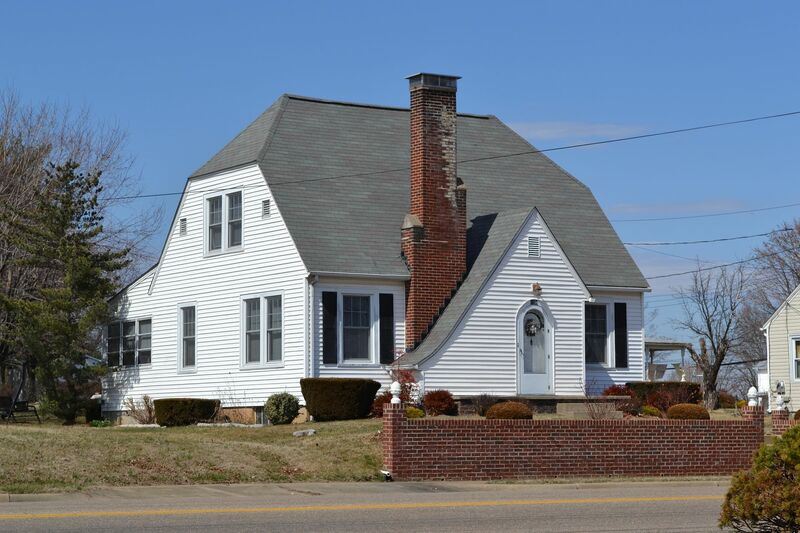 A key feature in identifying this very simple house is the small space between those two windows in the gabled bay (dining room). And the other side is a good match, too! Despite two days of driving around, we never did spot the Stanhope (Aladdin) purchased by Mr. Linkenholer. 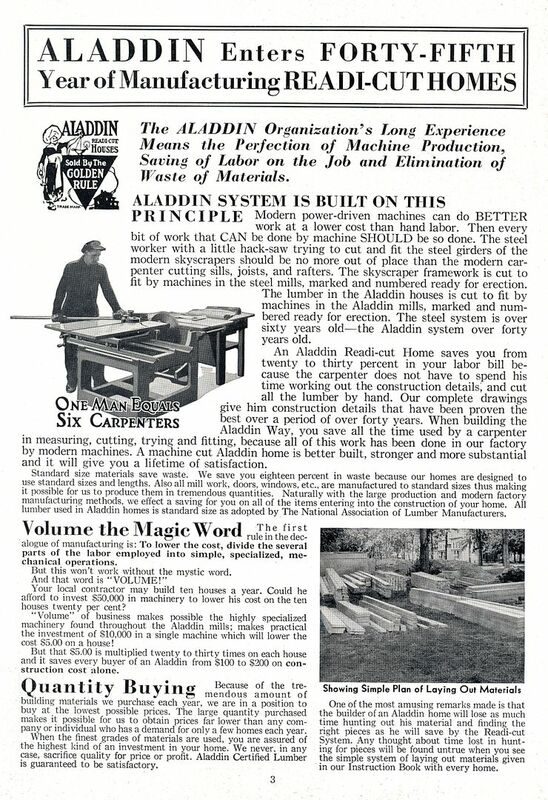 As seen in the 1919 catalog, here's a picture of the Aladdin Stanhope. Where's Mr. Linkholer's Stanhope? I'd love to know! 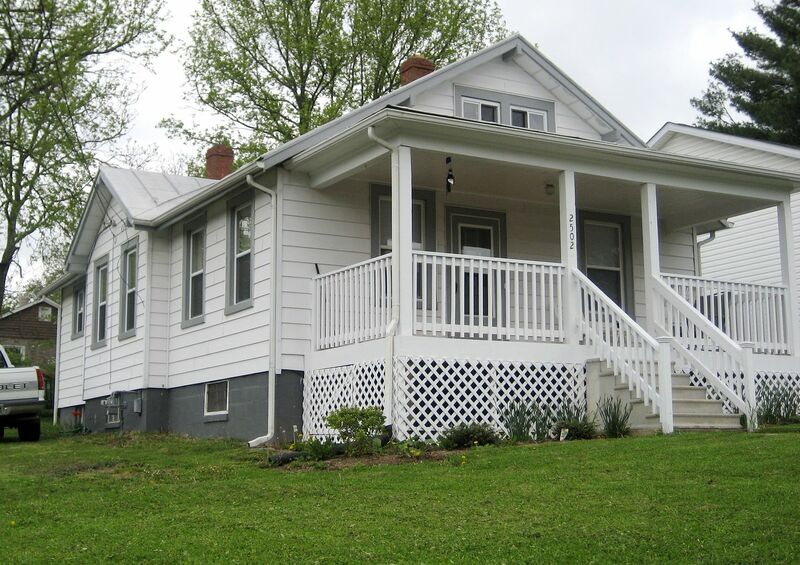 To read more about the kit homes of Staunton, click here. 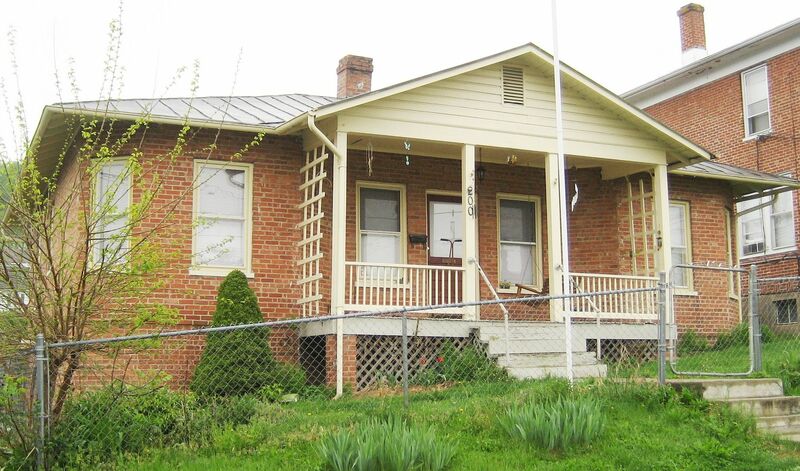 And Then I Found a House I’d Never Seen Before (in Staunton)!! 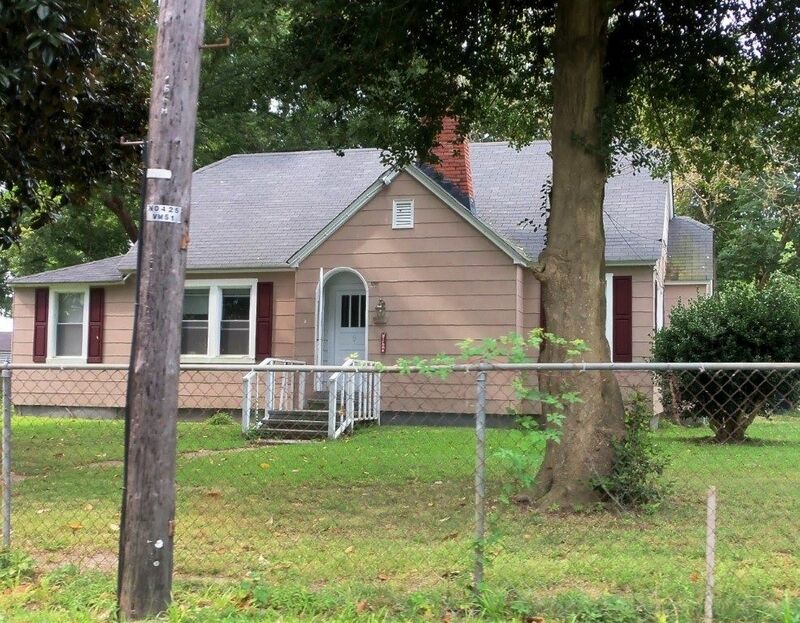 Several days ago, I wrote a blog about the abundance of kit homes I found in Staunton, VA.
A fine fellow named Frank left a comment at that blog about a possible kit home at 1102 North Augusta Avenue (in Staunton). Thanks to Google Maps and their sharp images, I “drove” to the address (via my laptop). 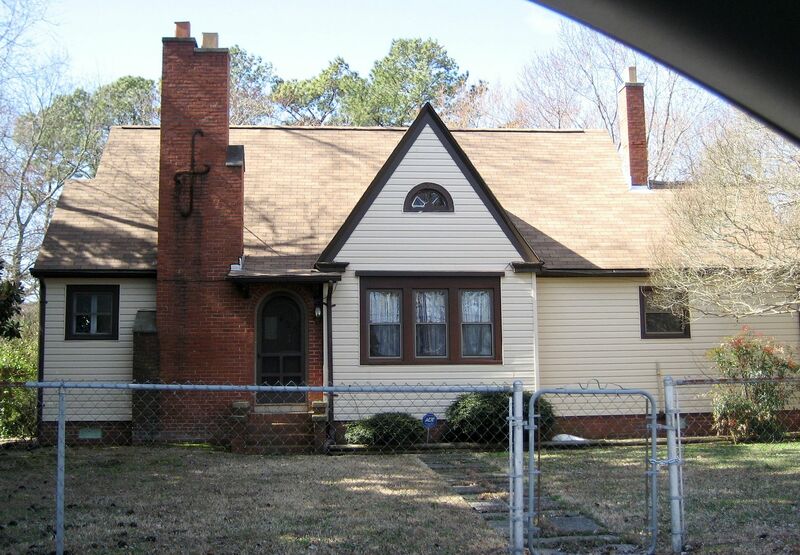 As it turned out, the house he’d mentioned on North Augusta was not a kit home, but then I saw something next door that really piqued my interest! 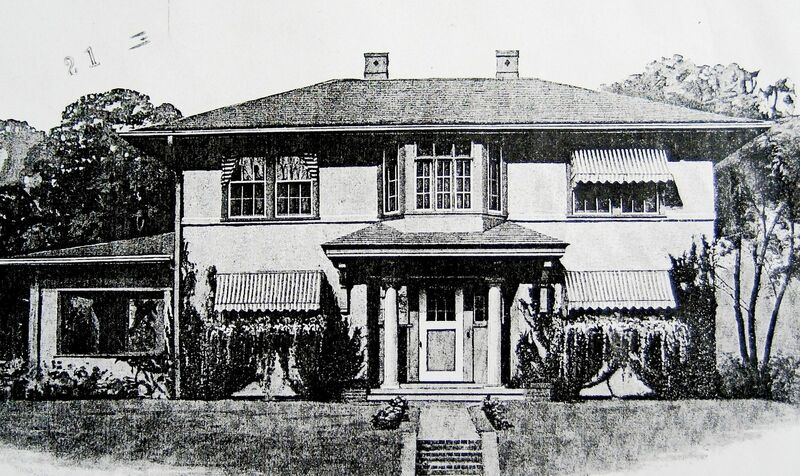 Next door at 1106 North Augusta was a beautiful home, and I recognized it as a catalog house, but I couldn’t remember WHERE I’d seen it. Was it from a kit or a planbook? 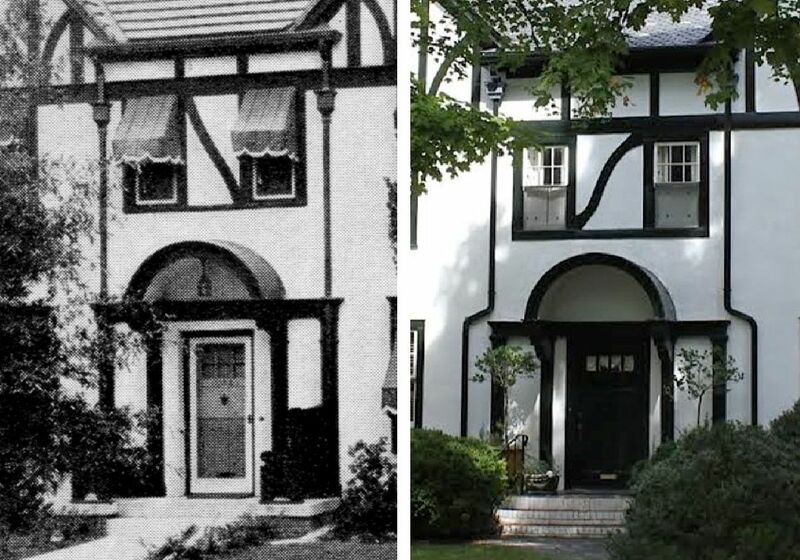 I knew I’d seen that house in one of my books, but where? I closed my eyes and tried to pull up the image mentally, but to no avail. 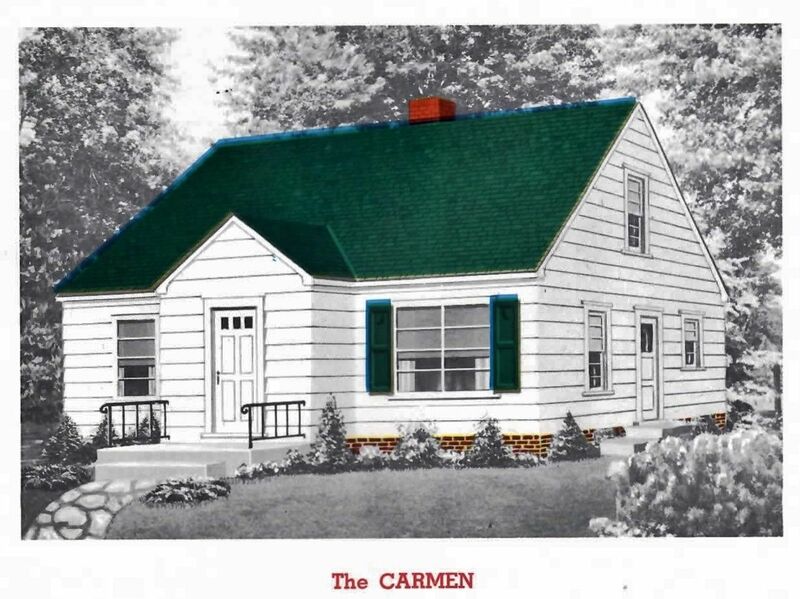 Next, I dug out the catalogs and pored over thousands of images, desperate to find this house. 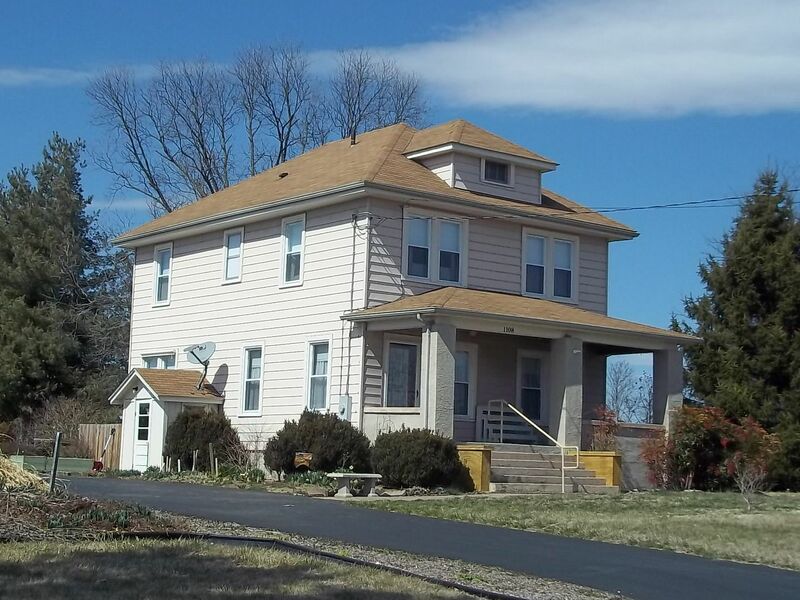 Through the days, I’d lie down, take a deep breath, close my eyes and “see the house” (in Staunton) and then try to match it up with the houses in memory. It was not a strong memory. I could “see” the black and white image in my thought and tried to scroll up on the mental page to see what catalog I was looking at. Honestly, it got somewhat frustrating. 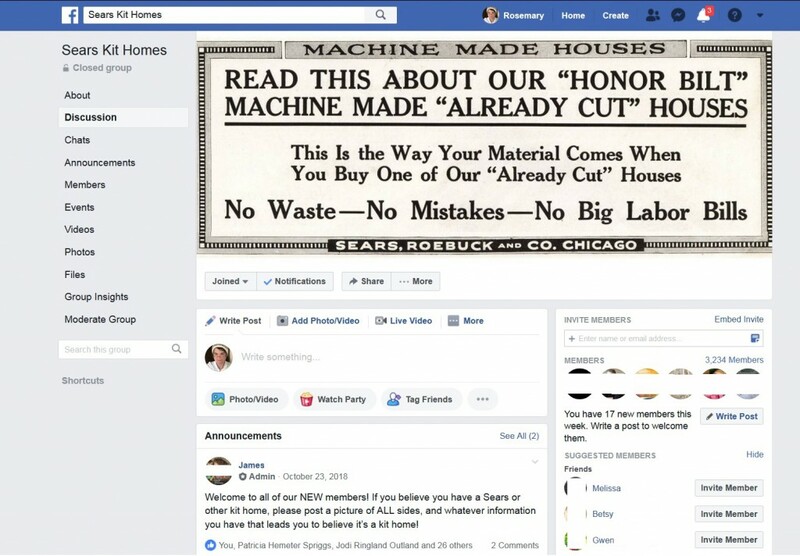 Several days ago, I posted the image on Facebook, in our “Sears Homes” group. And then this morning when I logged onto Facebook, I found a message from one of the most active members, Cindy Catanzaro. 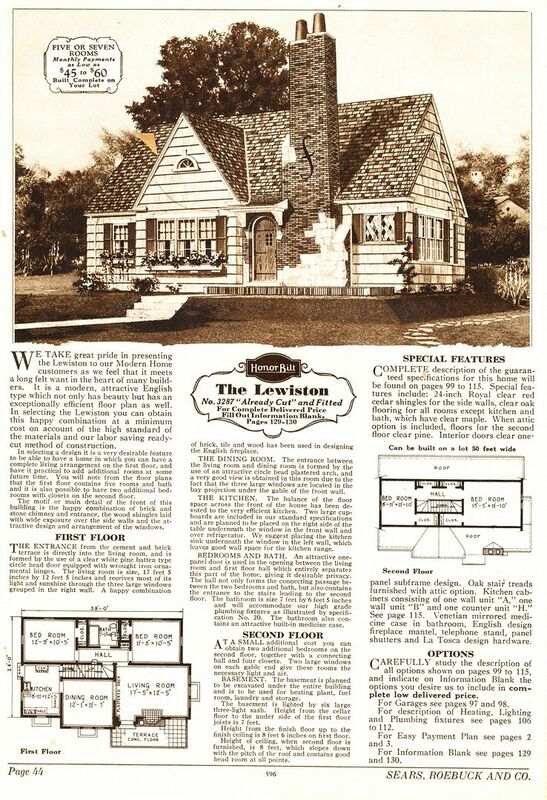 She’d found the house in a Gordon Van Tine catalog. 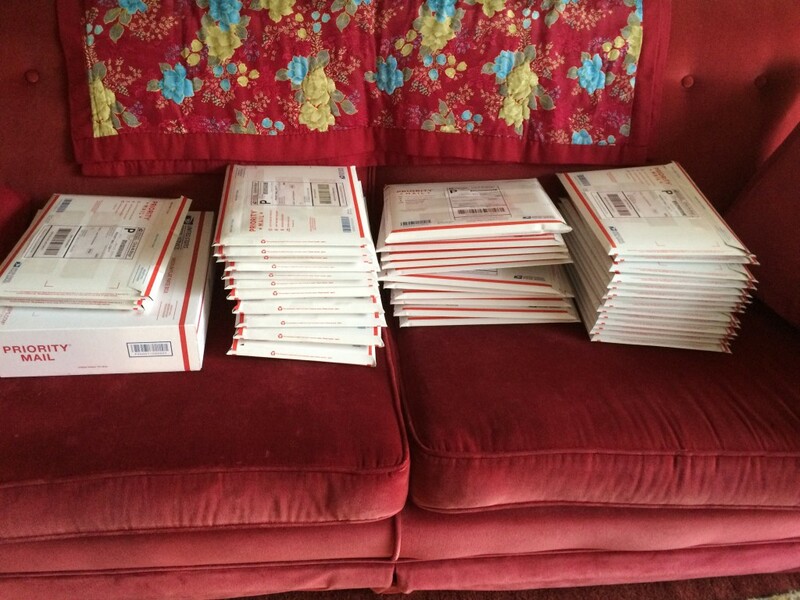 I was over-the-moon happy, and my brain was happy, too. No more endless searching for a faint image. No more walking into walls while my tormented mind was on overdrive, desperate to match up the Staunton house with the thousands of images rattling around in my head. 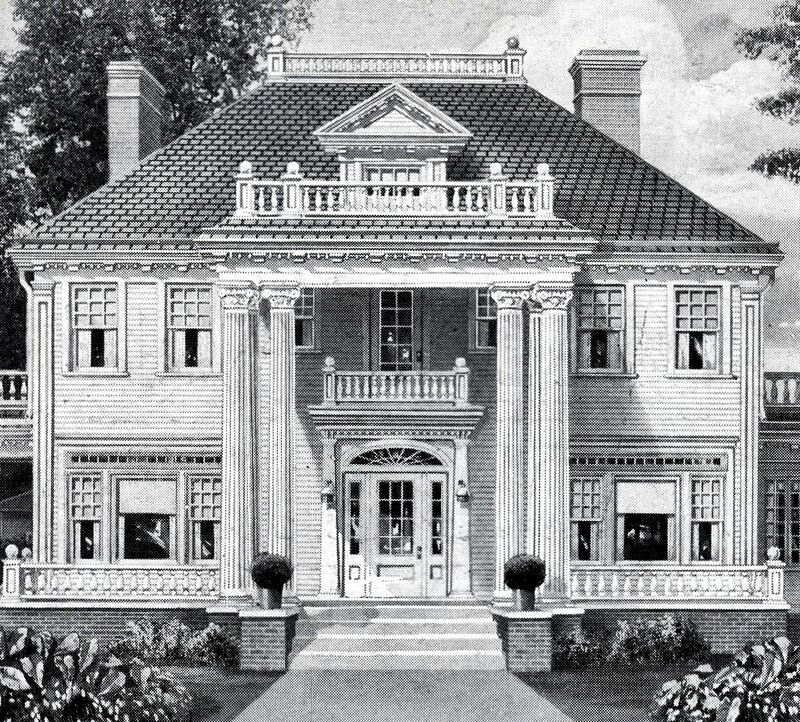 And the best part is, the house in Staunton is a spot-on match to the Gordon Van Tine “Sussex.” It is a beauty! And how did I miss it? 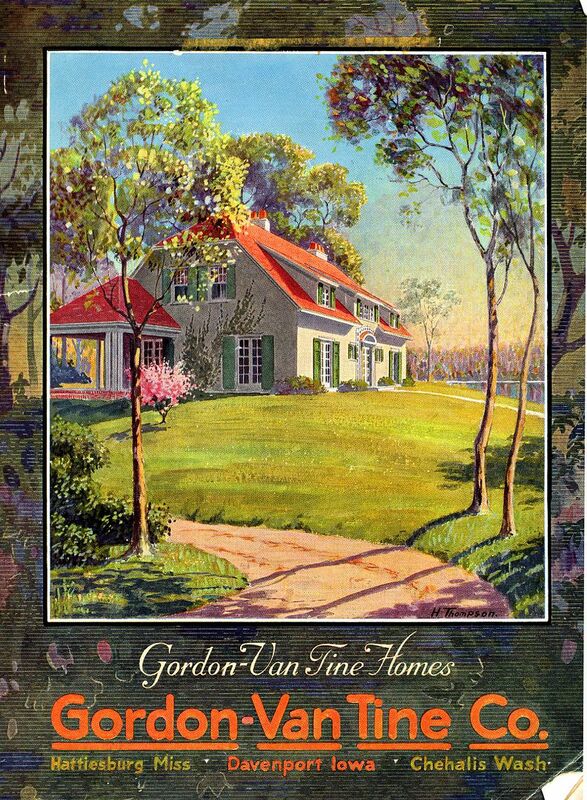 I have a home-made field guide to the kit homes offered by Gordon Van Tine. 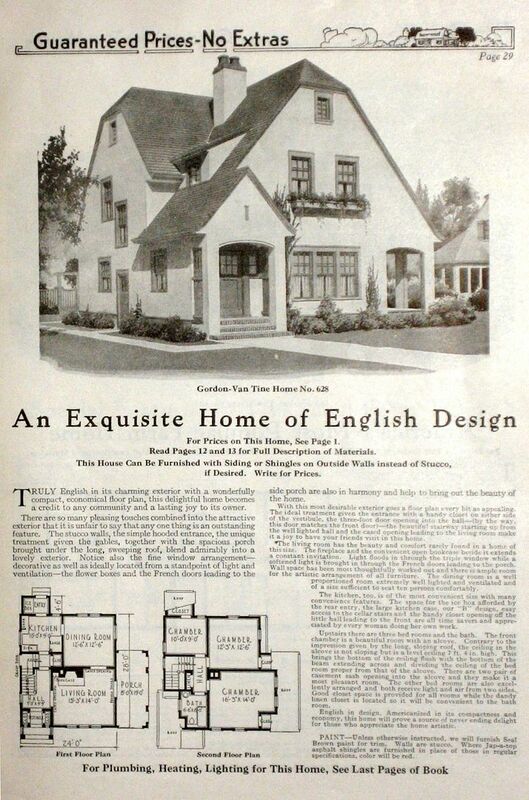 It’s got about 500 house designs in it, organized by style, but the Sussex was not in my field guide. 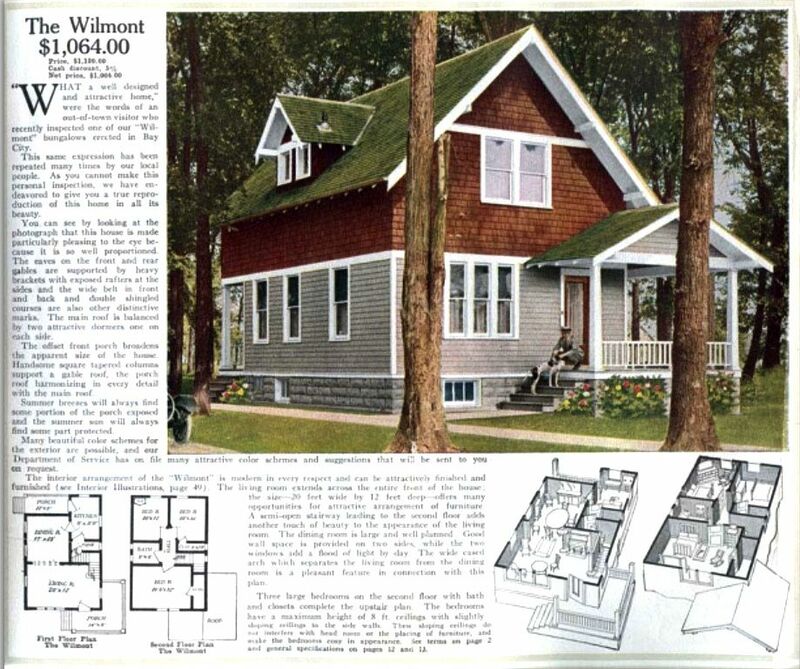 Complicating matters even more was this: Gordon Van Tine fulfilled all the orders for the Montgomery Ward kit homes (Wardway Homes), but there were a handful of designs that were exclusive to Gordon Van Tine. The Sussex was one of them. So the Sussex fell through the cracks of my copious collection of kit home catalogs! 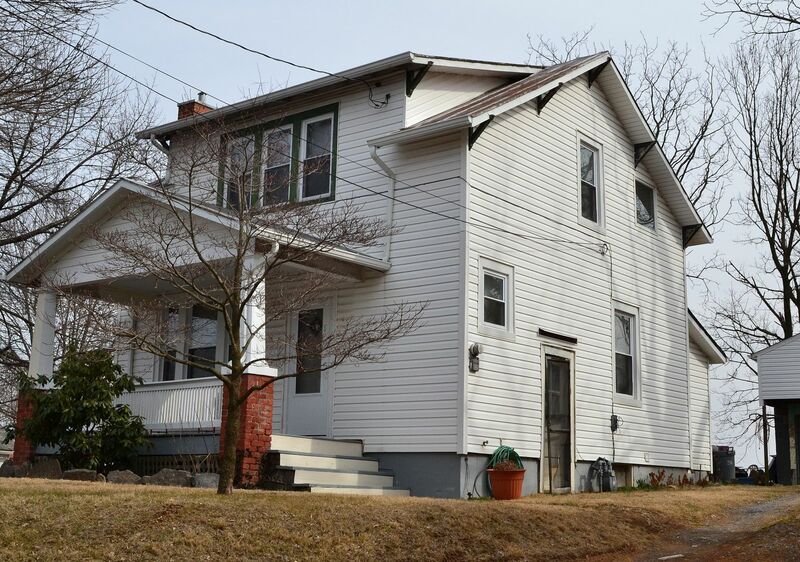 Thanks again to Frank for the tidbit that led to me finding this house, and thanks to Cindy Catanzaro for solving the mystery, and thanks to the owners of this house in Staunton (Alan and Sharon) for allowing me to use their photo! 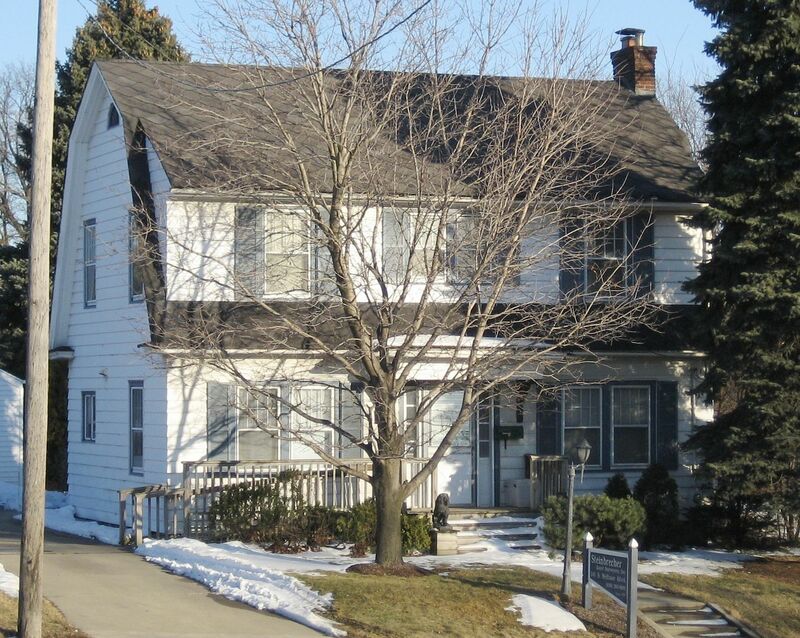 And, I recently discovered that this fine old house is a famous Bed and Breakfast! Click here to learn more! 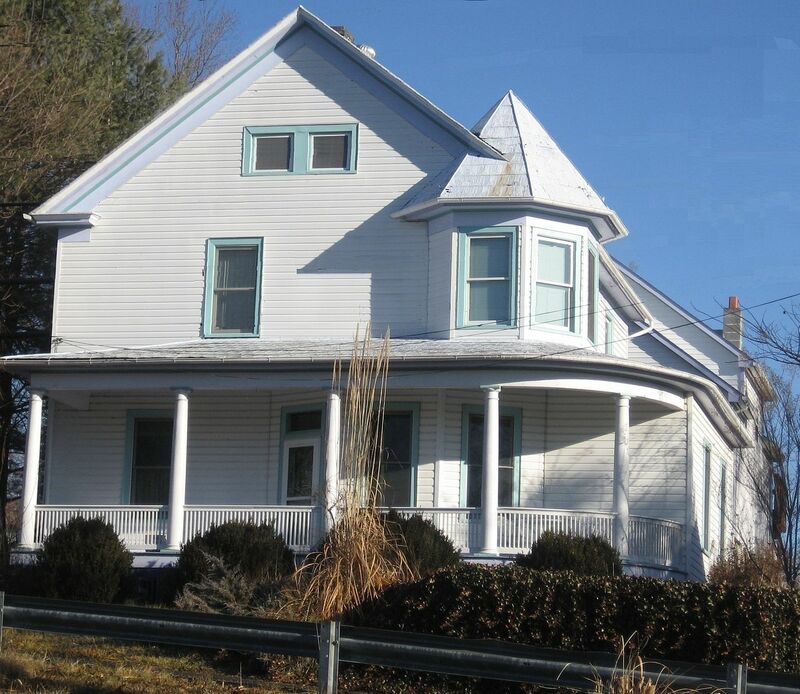 And, as a side note, this house is currently for sale and if I lived in Staunton, I’d be all over that! 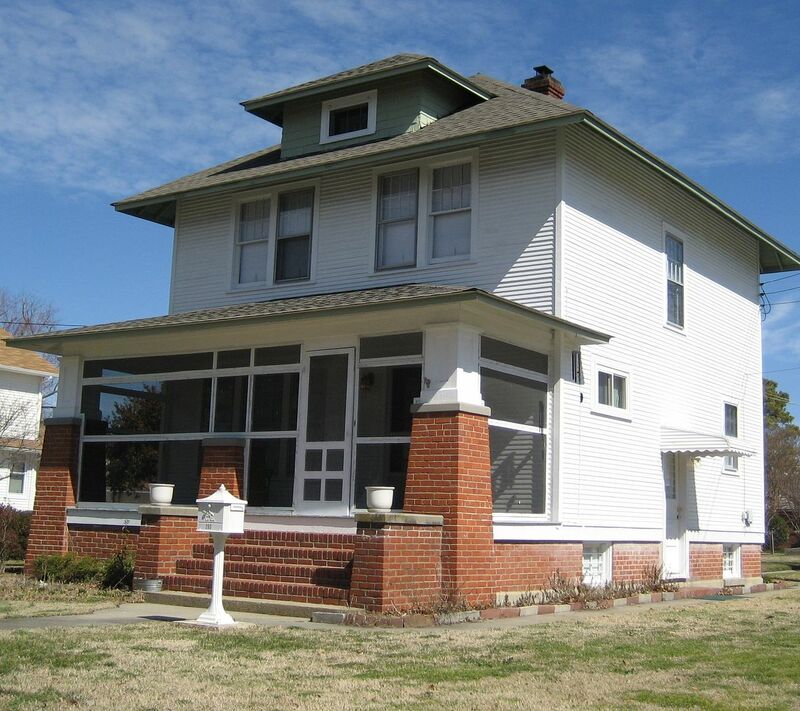 To learn more about this wonderful home, visit the B&B website, here. 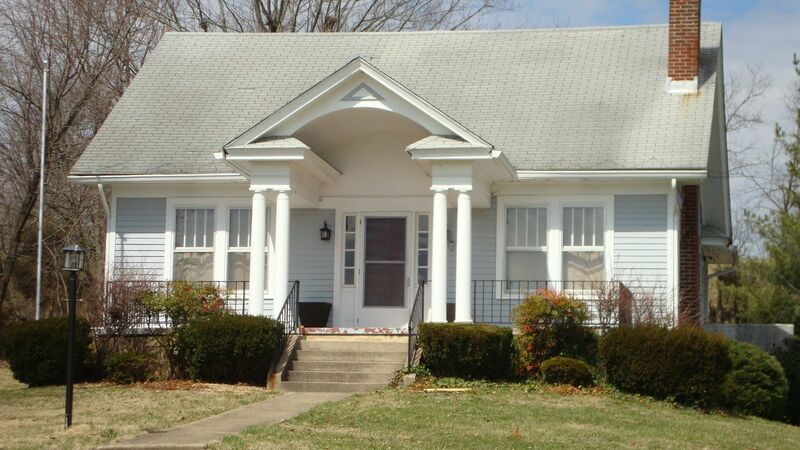 If you know of any other kit homes in Staunton (or surrounding areas), please leave a comment below! 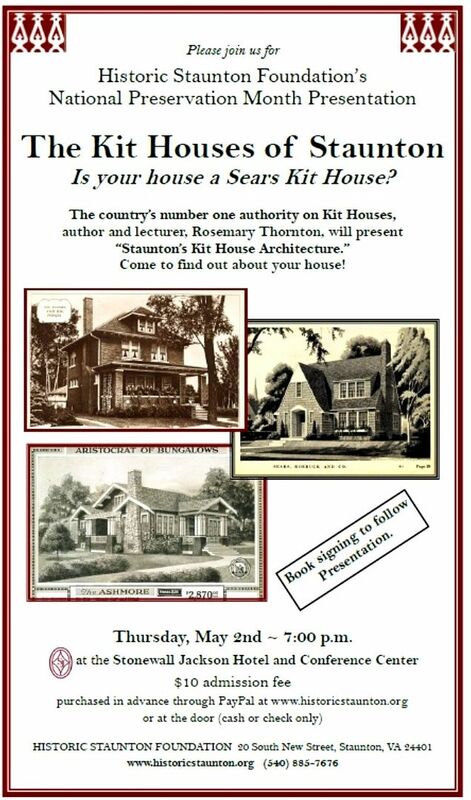 Want to learn more about kit homes? Click here to join our merry band on Facebook! In the 1926 catalog, it was Model #628. 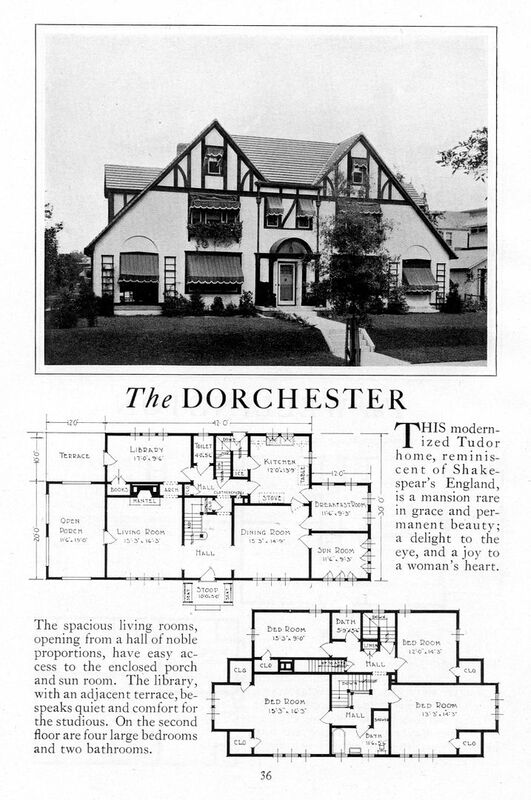 In the 1929 catalog, it was named "The Sussex." 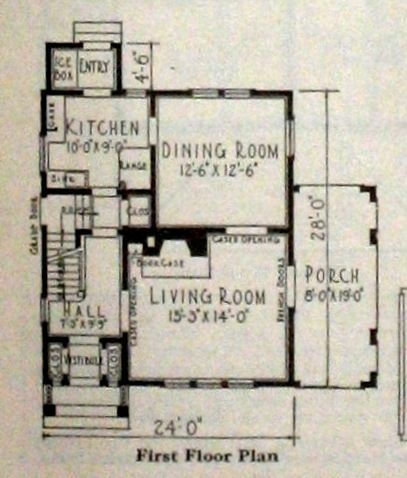 It's a bit grainy, but you can see the floorplan here. And here's the Sussex, in all its beauty and grandeur. Thanks to Leslie Hayes, I now have a bigger and better photo of the Sussex! 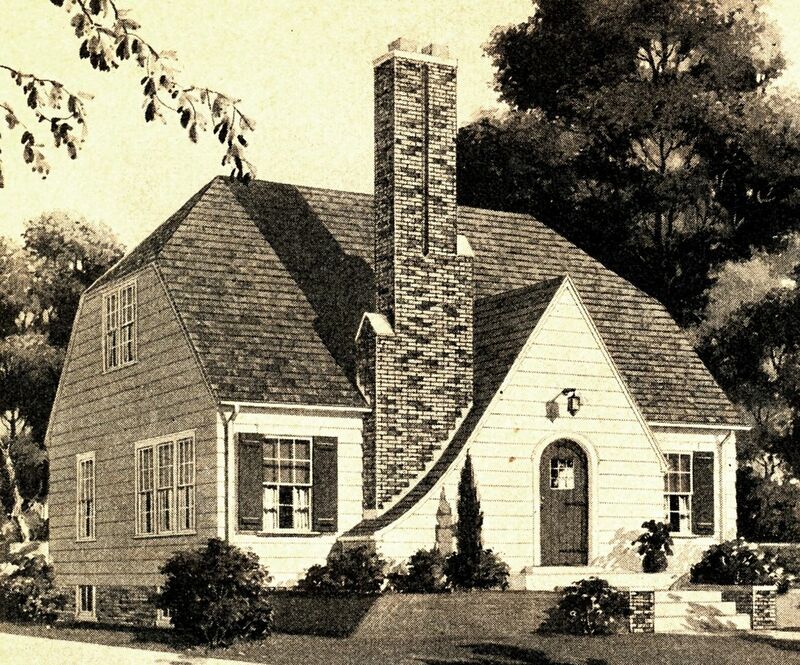 What a perfect match this house is to the catalog page! Photo is copyright 2013 Leslie M. Hayes and may not be used or reproduced without written permission. The Sussex in Staunton from another angle. It's a good looking house from all sides! Photo is copyright 2012 Alan Kincheloe and may not be used or reproduced without written permission. Ooh la la, what a match!!! 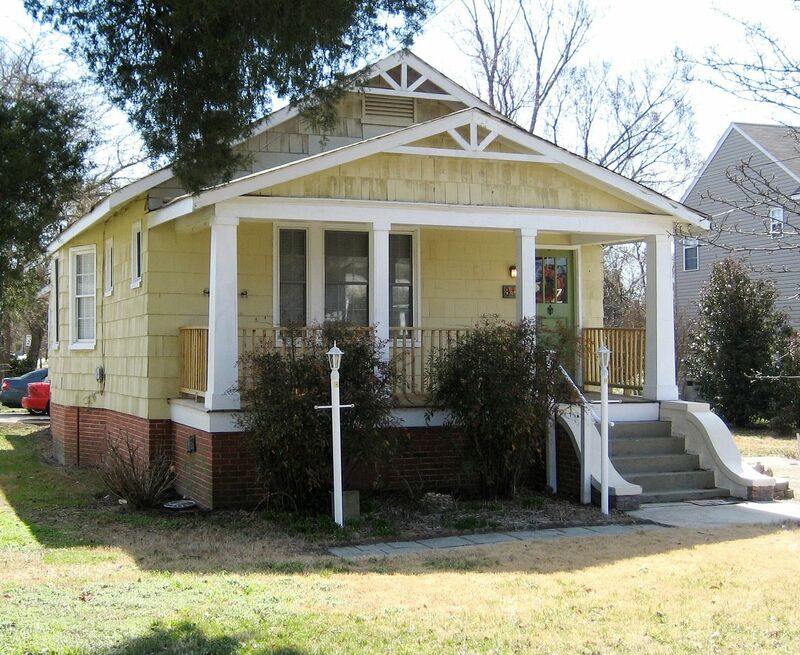 To read more about the kit homes of Staunton, click here or here. 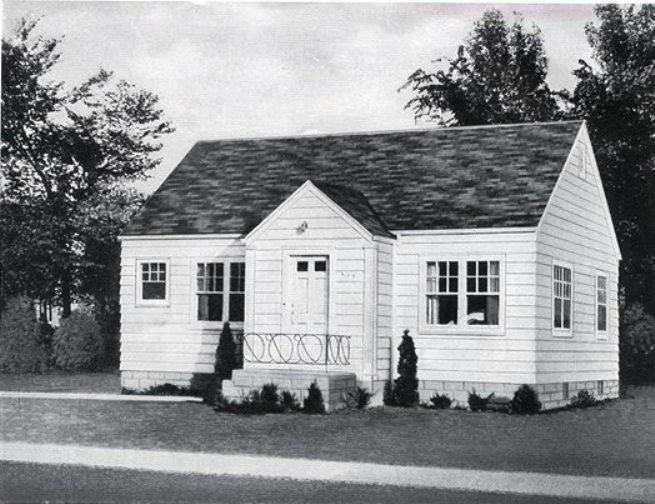 To learn more about what makes these kit homes so valuable (and such an important piece of America’s cultural history), click here. However, thanks to the indefatigable efforts of Andrew Mutch, Wendy Mutch and Melodie Nichols, we now have pictures of a beautiful Chesterfield in Clawson, Michigan. 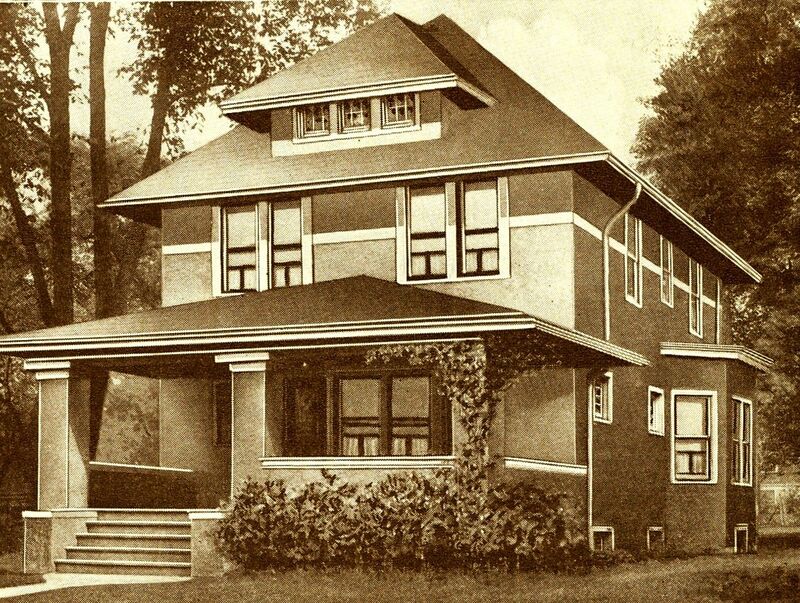 For those visiting this page for the first time, you might be wondering, what is a Sears Home? 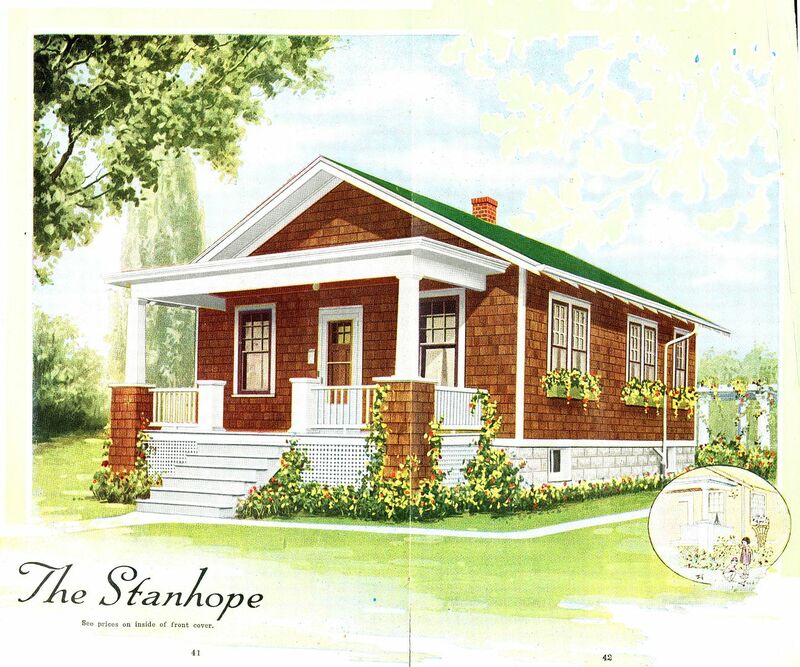 These were 12,000-piece kits that were ordered right out of the pages of the Sears Roebuck catalog. 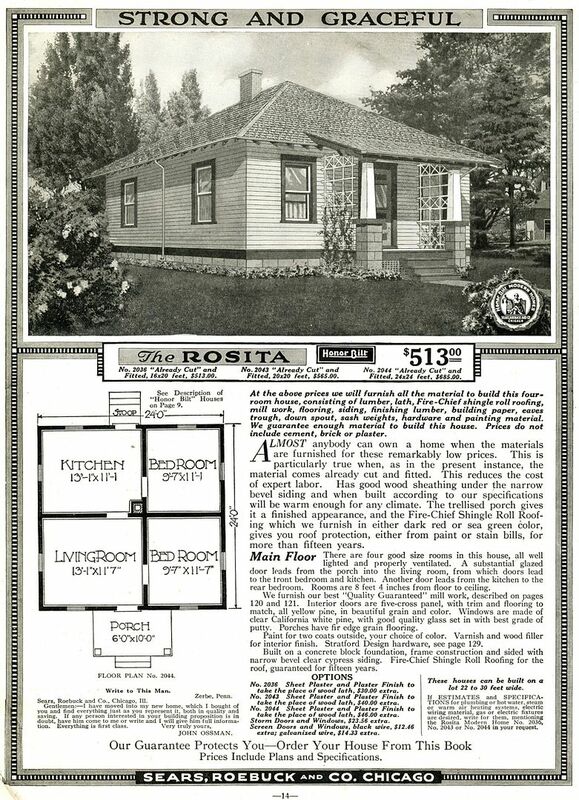 The homes were offered from 1908 - 1940, and during their 32-years in the kit home business, 370 models were offered. 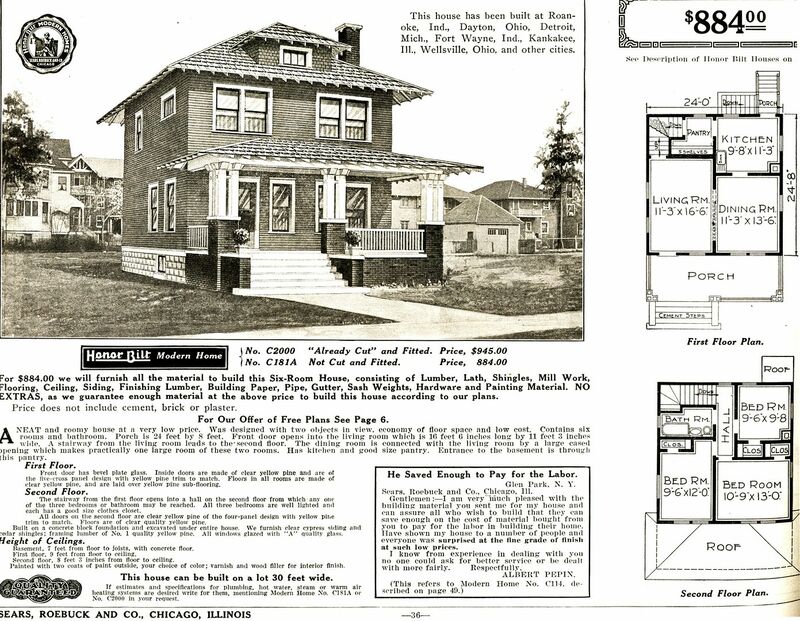 Sears promised that a “man of average abilities” could have the house built and ready for occupancy in 90 days. That could have been a little ambitious. 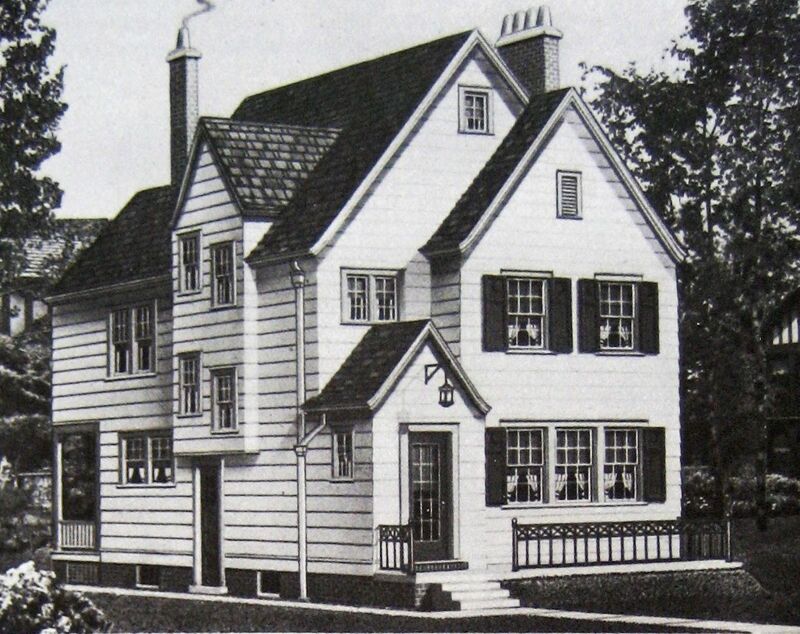 Typically, it took novice homebuilders six months or more to finish these homes. To learn more about this fascinating topic, click here. 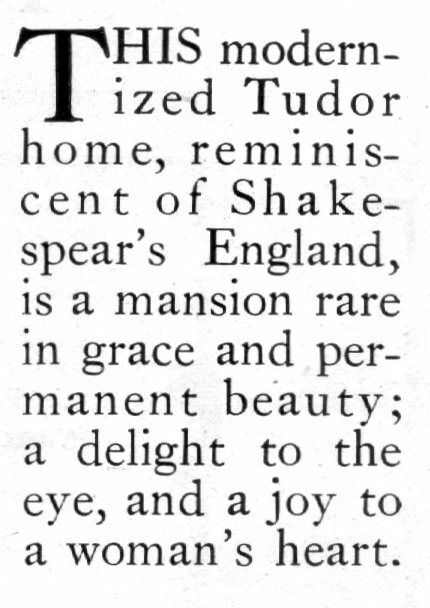 Pricey little dog, given the fact that this was 1926. I don't see any informal massing of the walls here. However, I bet that breakfast room was a chilly place on a balmy Michigan winter morning. I wonder if the "informal masses" are hiding in the spacious closets? 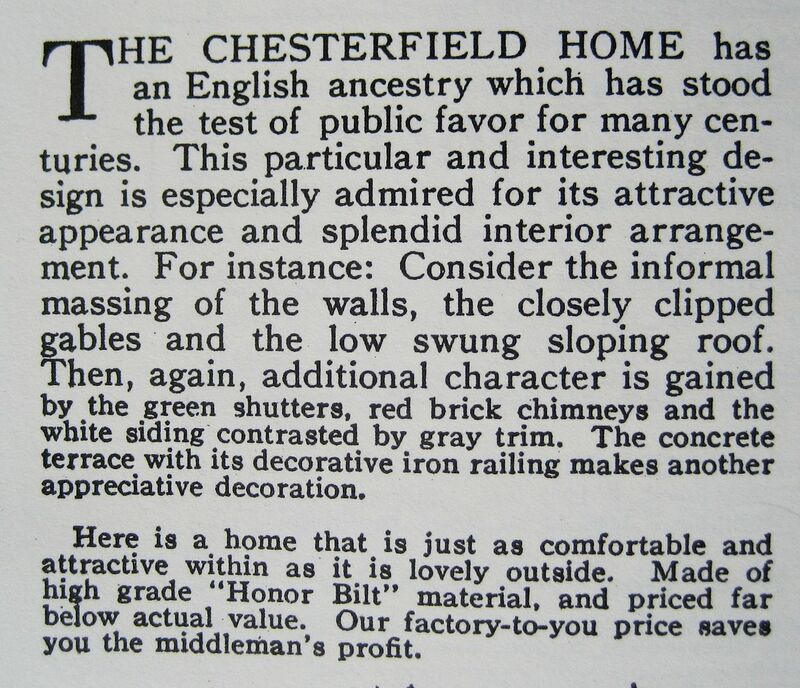 Chesterfield, as seen in the 1926 catalog. What a beauty! It's been altered a bit but the original lines are still there. And the third floor of this house must be quite spacious. 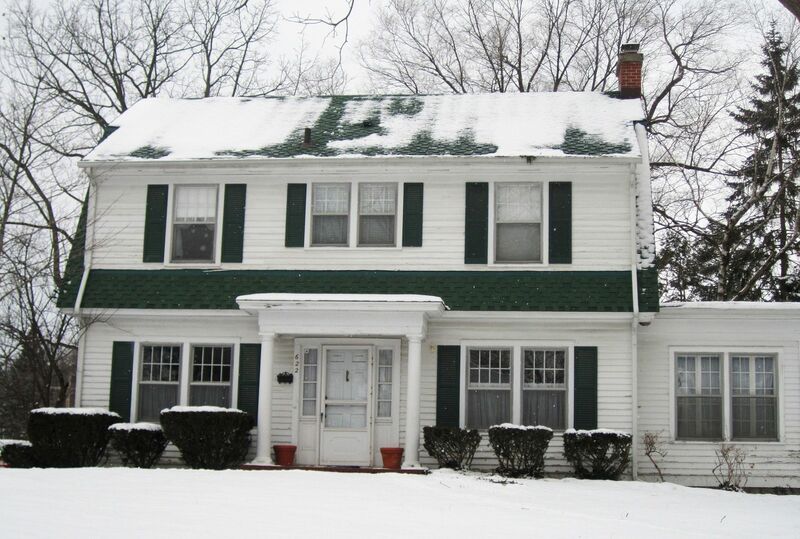 This house is in Clawson, Michigan which (thanks to Andrew, Wendy and Melodie) has been found to be a real hotbed of kit homes! Photo is copyright 2012 Melodie Nichols and may not be used or reproduced without written permission. A side view of the Chesterfield. 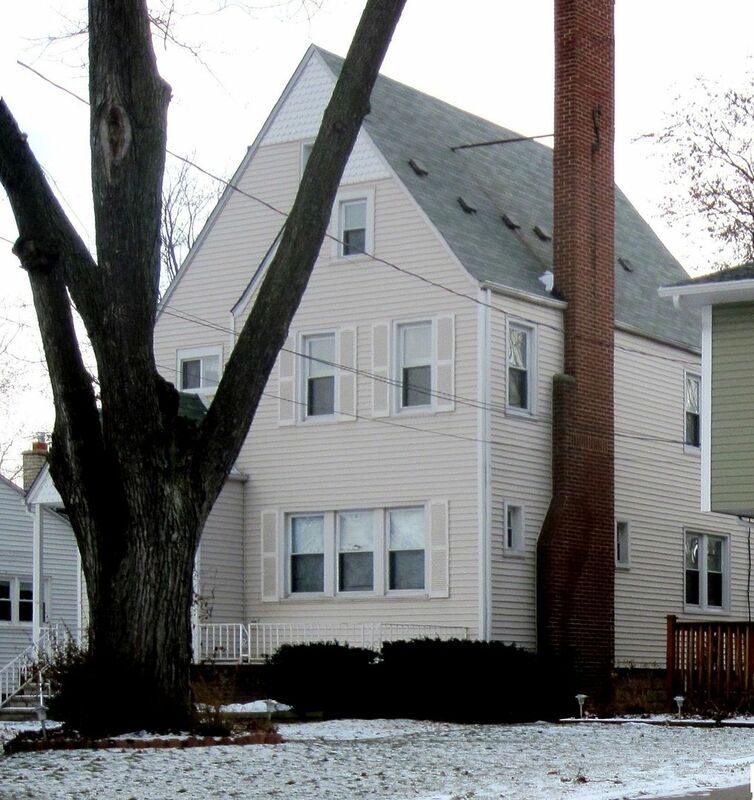 Look at that enormous chimney. Photo is copyright 2012 Melodie Nichols and may not be used or reproduced without written permission. Oh my stars, now we KNOW it's a Sears Home! 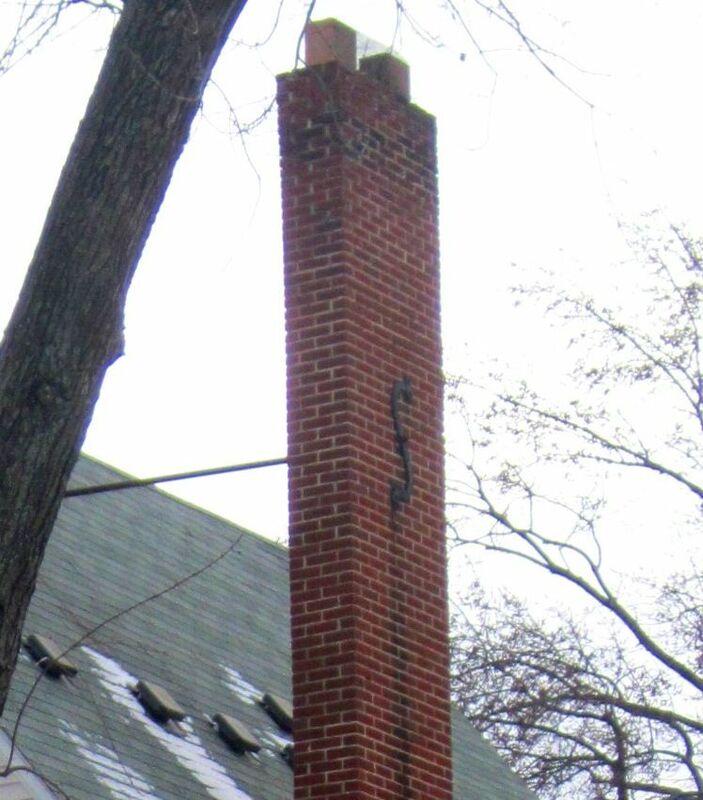 It has an "S" on the chimney!! Ah, not really. This is one CRAZY myth that is still bouncing around on the internet. 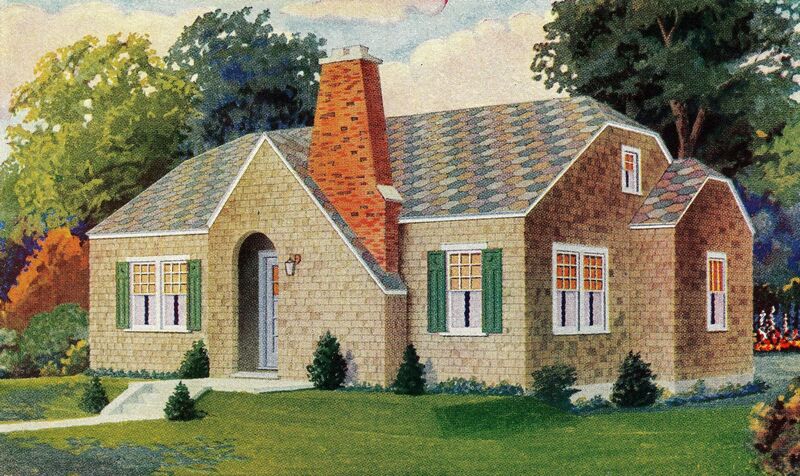 That "S" on the chimney is a stylistic feature that has nothing to do with whether or not it's a Sears House. In this case, that "S" is part of the brace that helps keep that oversized chimney stable. Photo is copyright 2012 Andrew and Wendy Mutch and may not be used or reproduced without written permission. Nice shooting, Melodie! 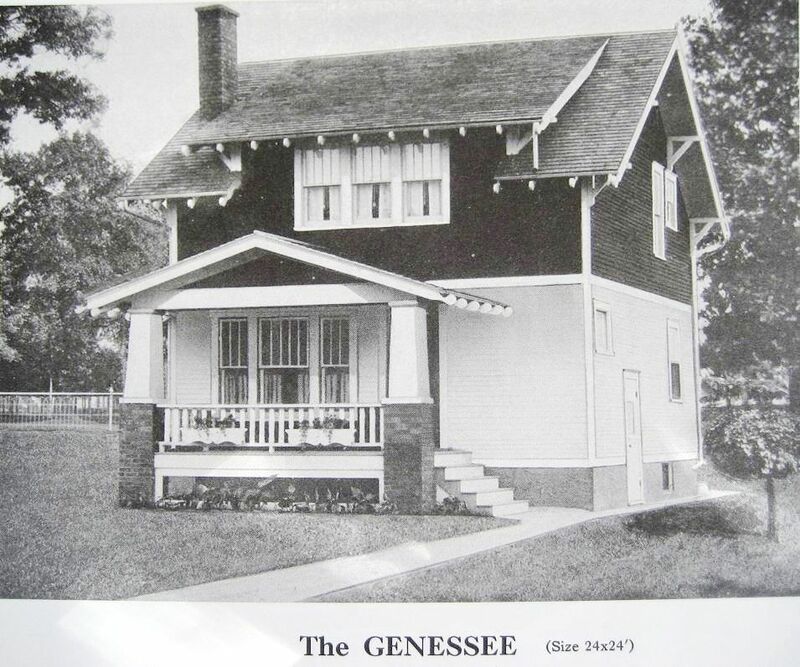 She did a perfect job of photographing the house from the same angle as the original catalog picture. 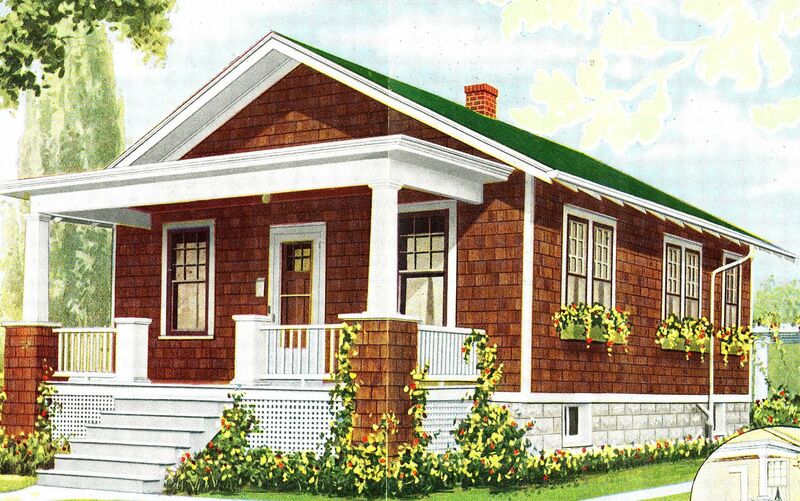 To read the next blog (also about kit homes in Michigan), click here. 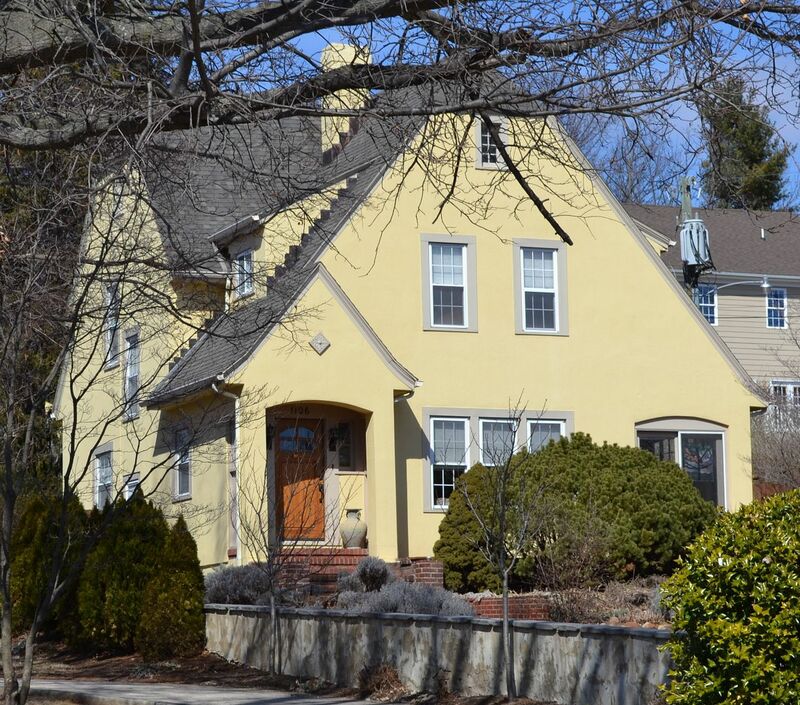 At first glance, the Rembrandt looks like a massive Dutch Colonial, but in fact, it was 1,672 square feet. 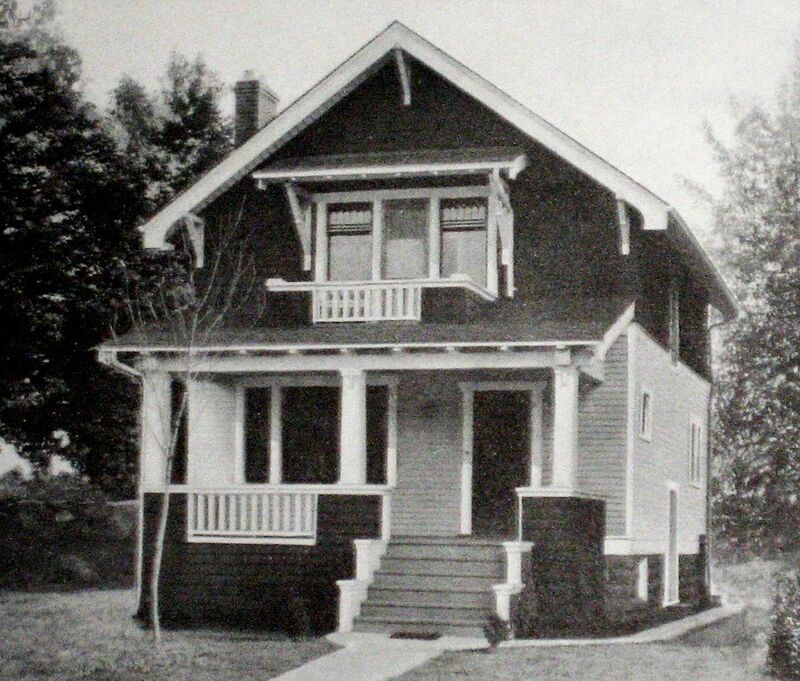 As early 1900s housing goes, this was certainly a spacious home, but not dramatically so. This still would have been quite a project to tackle! 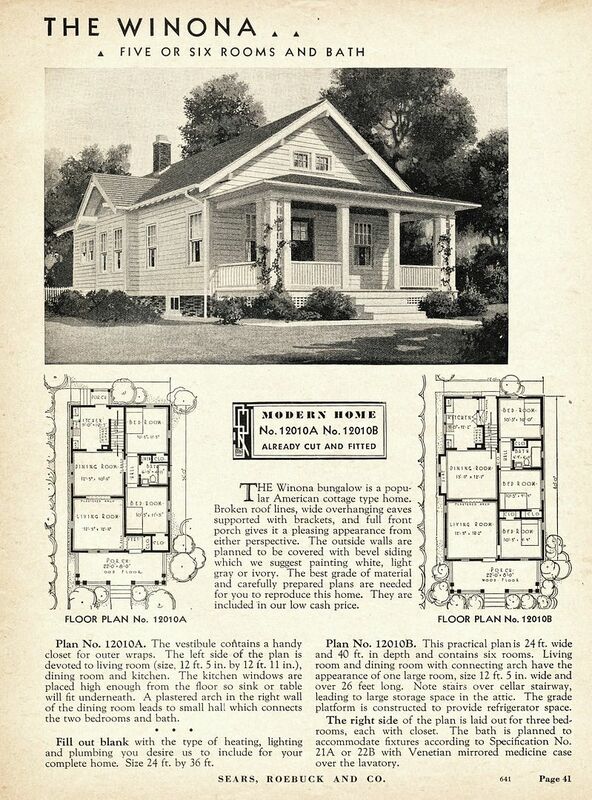 Based on my research, about 50% of the people who purchased Sears Kit Homes hired contractors to build their house, and the other half spent a lot of time poring over those detailed blueprints and built the house themselves! 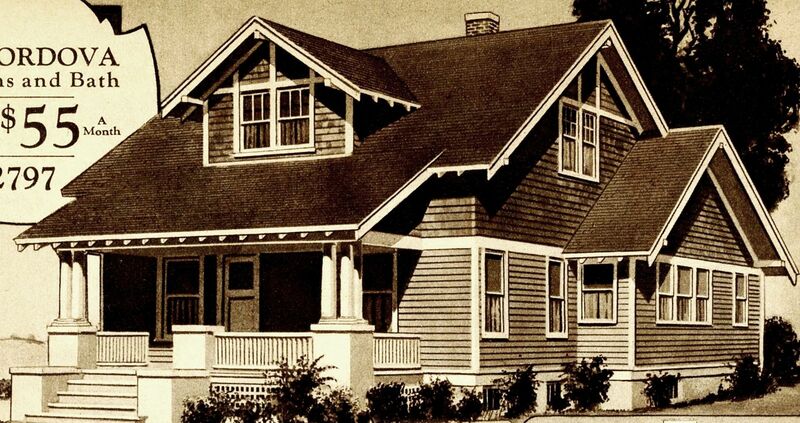 What is a Sears Home? Click here to learn more. 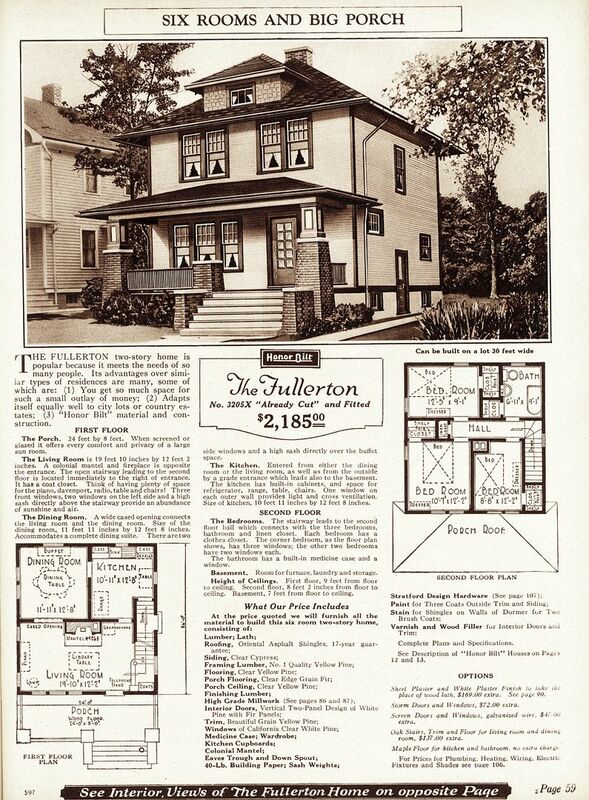 To watch Buster Keaton build a Sears Home, click here. 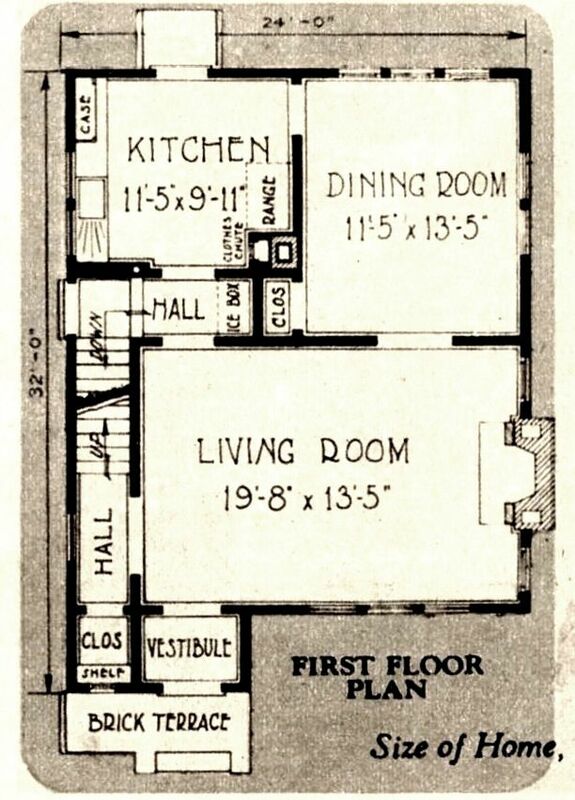 For a "big" house, it had a very small kitchen! Lumber was numbered to facilitate construction, but still, building the Rembrandt from a kit would have been quite a task! The real deal in Annapolis, MD. 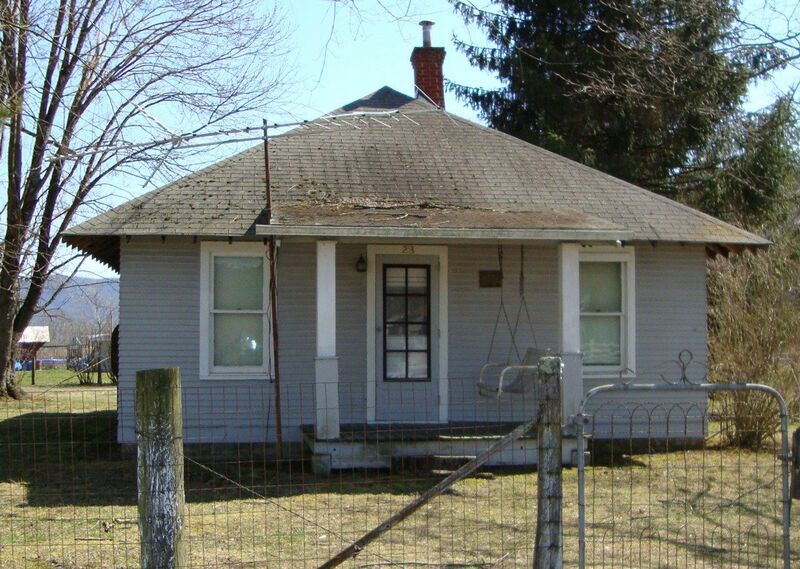 And notice it has Buckingham Slate on the roof. Buckingham Slate is the crème de la crème of slate and weighs 1,400 pounds per square. When building a house that will have a slate roof, the roof is specially constructed to accommodate this tremendous amount of weight. 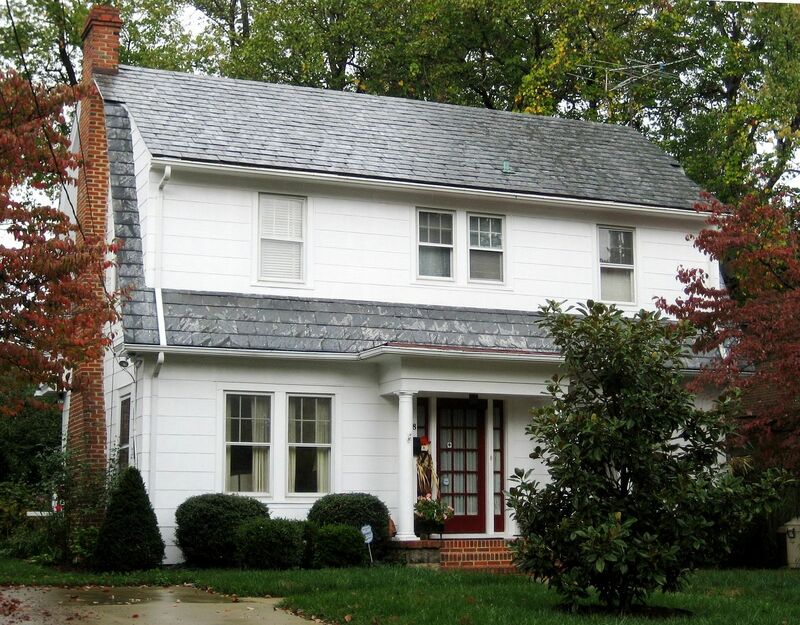 Here in the Southeast, I've seen several Sears Homes with this Buckingham Slate roof. Sears Rembrandt in West Chicago, Illinois. Where's a chain saw when you need it? This Sears Rembrandt is in Ann Arbor, Michigan. Photo is copyright 2012 Andrew and Wendy Mutch and can not be used or reproduced without written permission. 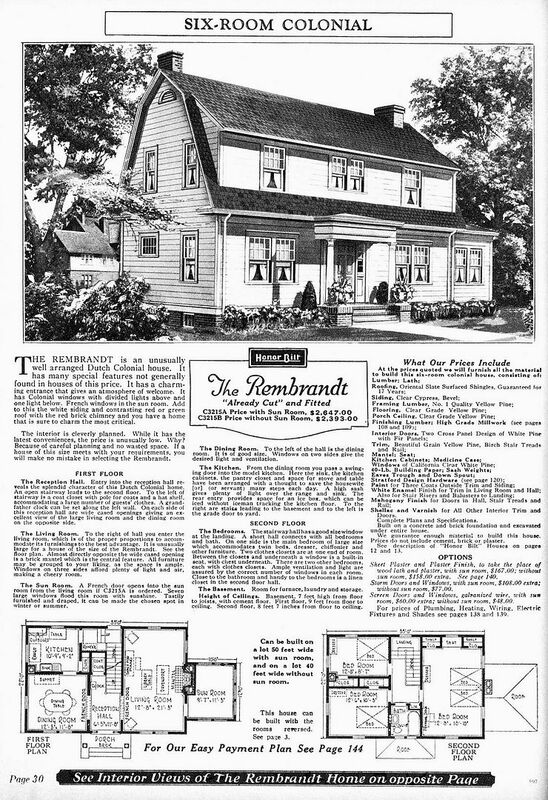 Comparison of the Rembrandt in Ann Arbor with the original catalog picture. Beautiful house but it sure looks chilly!! Photo is copyright 2012 Andrew and Wendy Mutch and can not be used or reproduced without written permission. 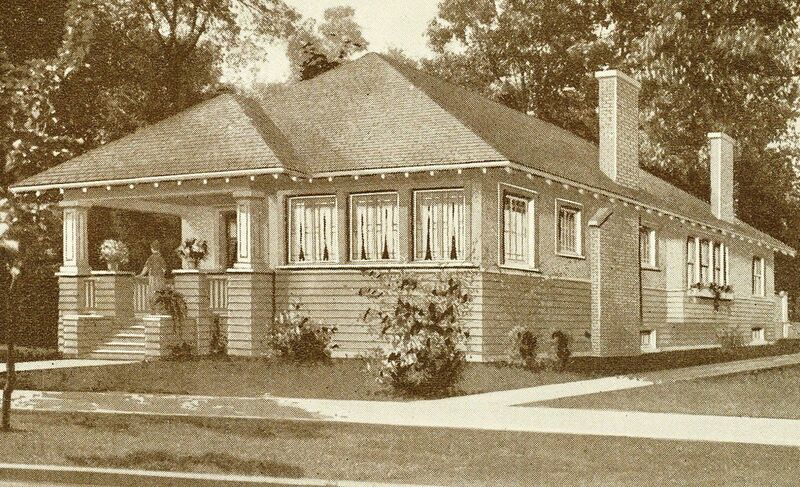 To read more about the Sears Homes that Wendy and Andrew found in Michigan, click here and here.